Prospects of an Hamburgensie - UNESCO World Heritage: Speicherstadt and Kontorhausviertel with Chilehaus. One of the most famous and beautiful views of Hamburg we experience on a trip on the U3 between Landungsbrücken and Rödingsmarkt. It does not matter if I get off at Landungsbrücken or Baumwall, here I am spoiled for choice in which direction I would like to stroll. Westwards it goes to the Old Elbtunnel and to the fish market, where already a lot of harbor atmosphere is to be felt. Or I turn to the east, where I look at the Kehrwiederspitze, which symbolizes the beginning of the Speicherstadt. Counter shot on the U3 with the Rickmer Rickmers and the Cap San Diego. View of Vorsetzen and Kehrwiederspitze. View from the bridge at the height of the investor "Vorsetzen" to the Überseebrücke. 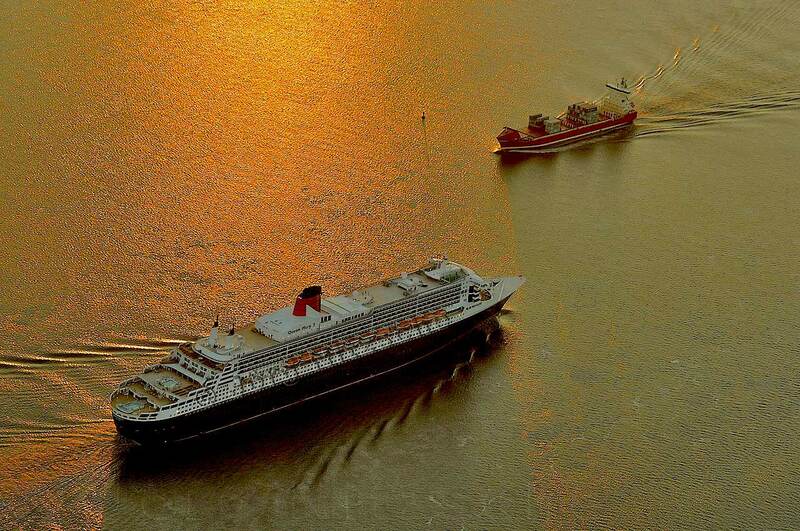 Farewell of the Queen Mary on the Elbe. Atmospheric jetties during the Christmas season. 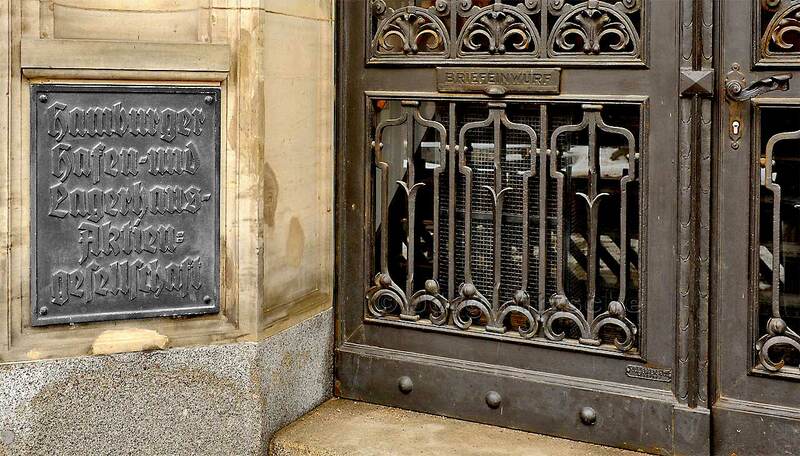 Hamburg - the gateway to the world - already in times of the Hanseatic League this gate was open for colonial goods such as spices, coffee, tea and cocoa and all sorts of other goods. 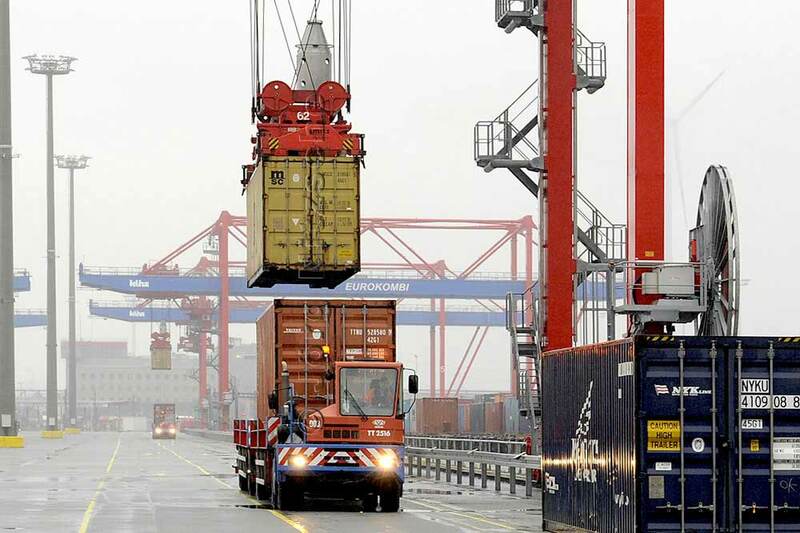 Due to its proximity to the open sea, Hamburg became an important hub of trade and shipping, a huge transhipment point for goods of all kinds, which want to be transported further inland and other European countries. Trade allowed the city to grow until today's Hanseatic city. At the same time, the proximity to the sea gave many emigrants the chance to use Hamburg as the "gateway to the new world" from the middle of the 19th century, in order to realize their dream there. The Auswanderermuseum "Ballinstadt" on the Veddel stands as a good testimony to this time and the longing of these people. But conversely, many merchants from other countries settled in Hamburg to build their own existence. For example, the family Cotterell, which I will come back to later. Between 1835 and 1866, the outline of the harbor emerged, as we know it today. From now on, with the development into a modern tidal port, the ships were able to enter and leave at any time of day or night, regardless of the tide and high tide. 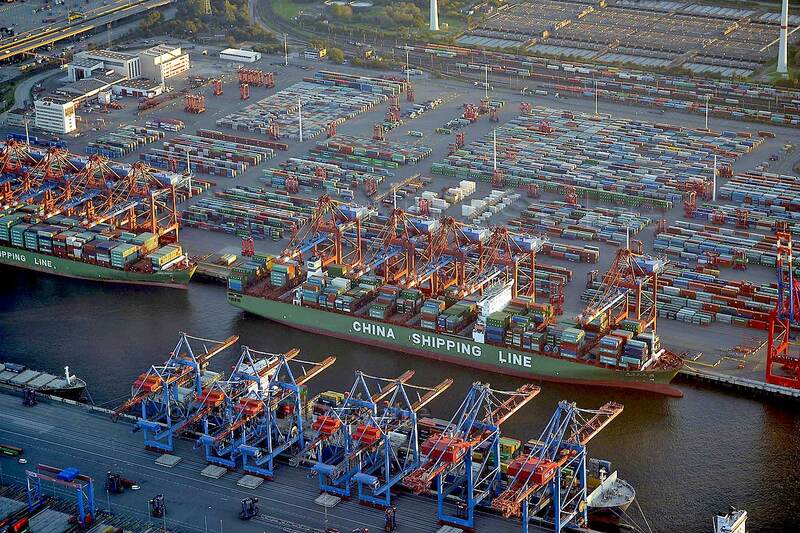 In 1888, Hamburg joined the German customs territory, which became the birth of the Hamburg Freeport. 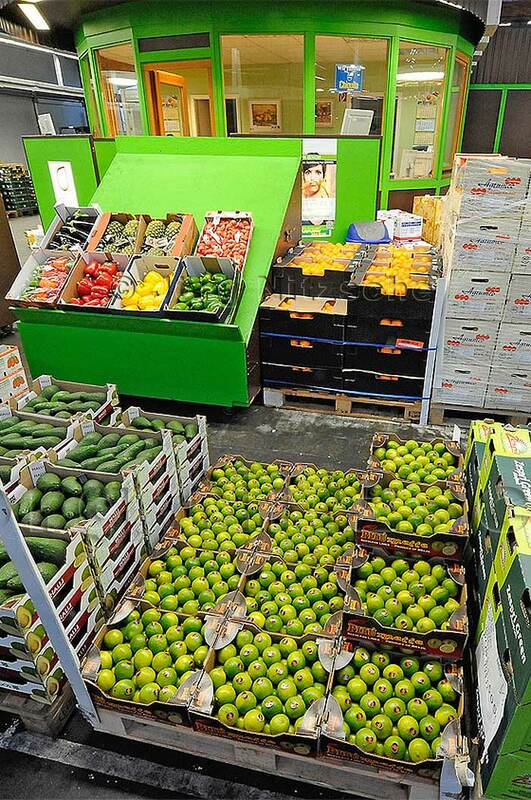 A free-trade and trading zone in which imported goods could be stored duty-free, processed and further processed. 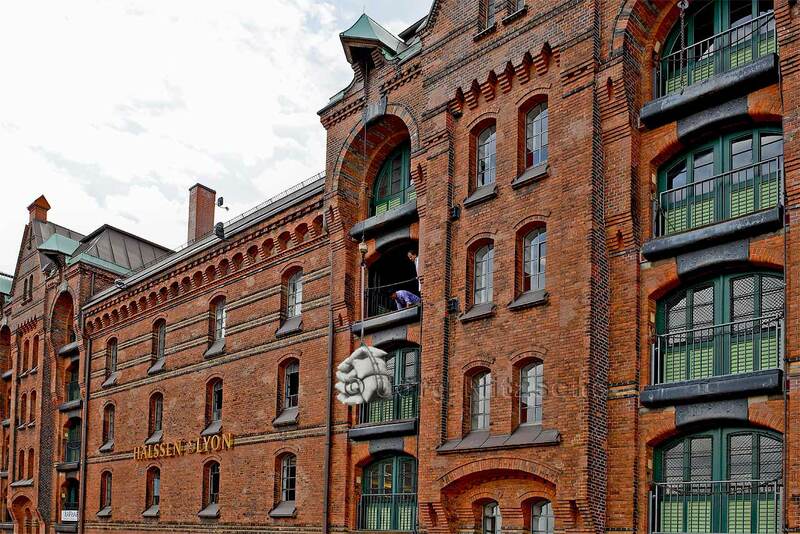 In parallel, the Speicherstadt, the largest warehouse complex in the world, was built in 1883. Just a few years after the start of construction, coffee, tea, spices or carpets are already stored in the red brick buildings. Coming from the historic Deichstraße the observer gets a glimpse of the beautiful façade of the old office buildings of the Speicherstadt. Where it once smelled like these goods and sometimes smells. 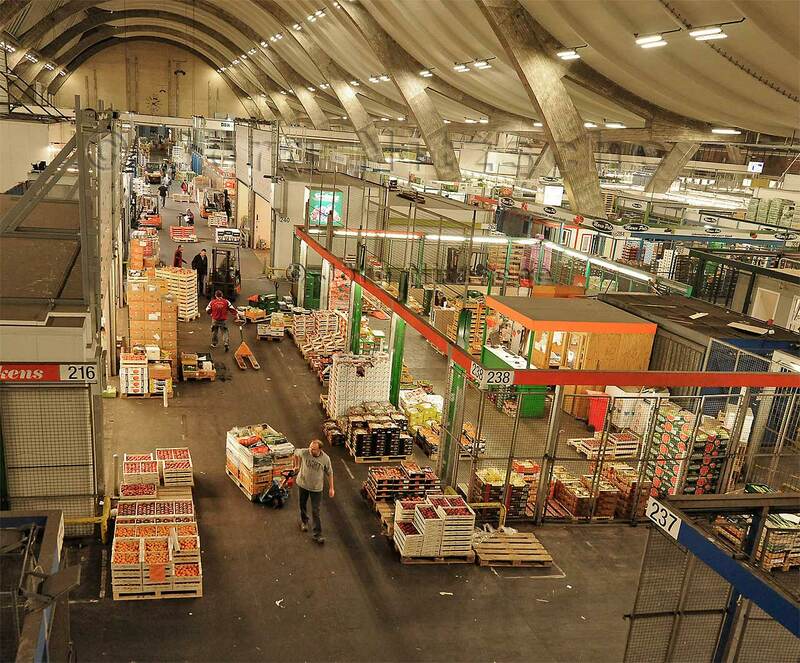 Thank the Spicy-Museum in the Speicherstadt that this warehouse culture here is told alive and odor-intensive. In the Spicys you get an idea of the exotic smells that have always been part of everyday life in the historic office buildings. Continuing along the customs channel we come directly to the German Customs Museum on the opposite side of the water. On January 1, 2013, the barriers went up forever after exactly 124 years. The free port, and thus also the customs controls are no longer since. The museum provides a comprehensive overview of the entire development of customs from the Roman Empire to the 1990s. 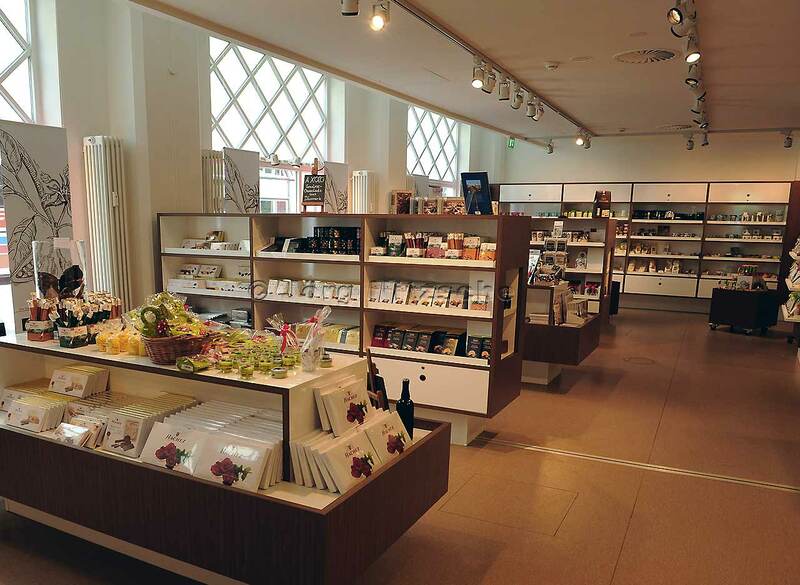 More than 2,000 exhibits in the German Customs Museum give a vivid insight into customs' work in the past and present. 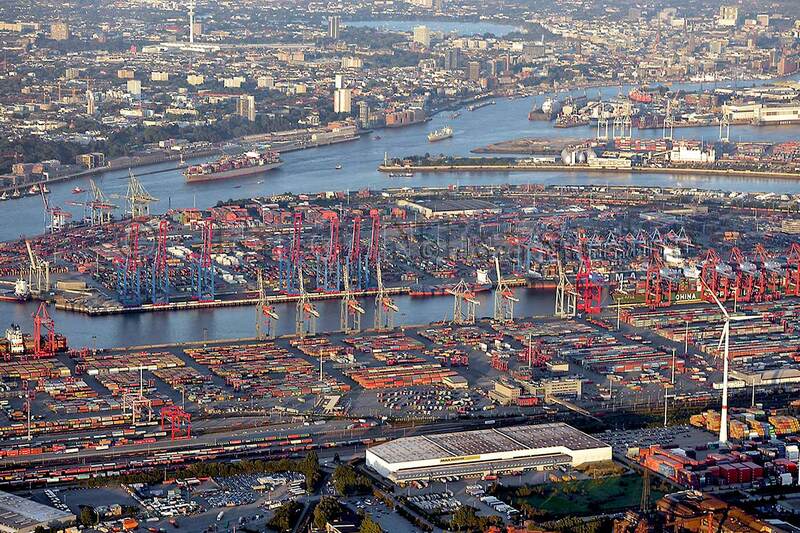 Until well into the economic miracle, the Port of Hamburg was a large cargo handling station. All goods, whether as bagged goods, in barrels or large equipment, were individually deleted and stowed away. Shortly after the Second World War, thousands of dockers unloaded the cargo of the ships with sack trucks and pure muscle power. Typically Hamburg was in the post-war period of the morning radio call for dockers who were looking for the deletion and stowage, and had to be located in the harbor. Chillers are day laborers who made sure that the goods could be picked up ideally by weight and position from the cranes. The Lascher were those who lashed the goods sea-tight. The day laborers had a distribution number and had to work one hour before shift start (a twelve-hour shift went from 6 to 18 o'clock) at the distribution point in Admiralty Street. Bring along stamp, disability and tax card. The time of the Steam towing barges, at the Vorsetzen they waited for their employment. 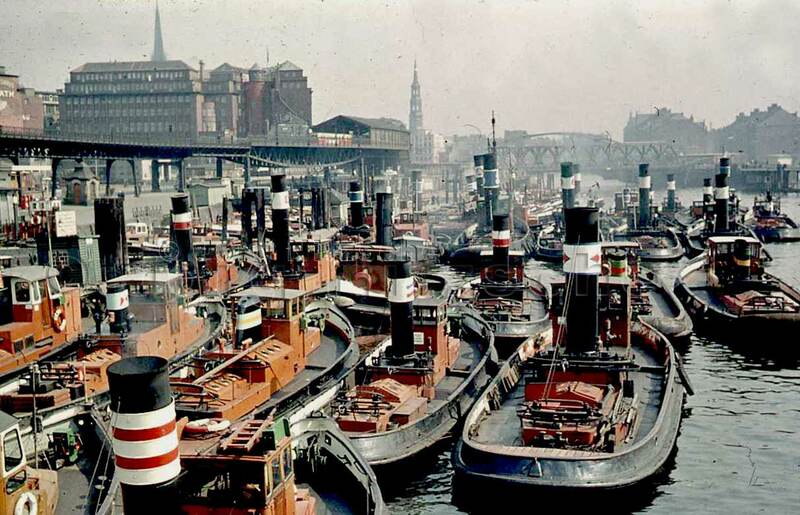 At that time the barges and harbor tugs were heard throughout the harbor area by the constant tolling of their steam whistles, which simply belonged to the good sound of the Port of Hamburg. There were more than 400 harbor steam tractors. They belonged to the Ewerführer-enterprises, which handled barges, tugs and barges traffic in the port. The convertible chimneys were a hallmark of the coal-powered steam tractors to cross the many bridges. Ewerführer is after the stevedores the second oldest harbor occupation in the port of Hamburg. In the middle of the numerous canals and the Neo-Gothic brick architecture of the Speicherstadt, they pushed or pulled the tea with their tow barges. Coffee and oriental spices laden barges to the individual storage floors, where the noble goods were hoisted up mostly as bagged goods by winch. Thus, the goods were hoisted in the warehouse floors in the office buildings of the Speicherstadt. Like finding a diamond in a pile of rubbish. At that time, harbor workers were swarming around like an anthill in the harbor, which could always be recognized in Hamburg's cityscape by its typical Elbe glider on its head and its brown leather bag. It contained the obligatory lunch box (bread lovingly smeared by the wife with cold cuts), a thermos of hot coffee and the other important accompanying utensils, such as pipe and tobacco, cheroots or cigarettes. On many small towed barges the Schauer people were driven by the Vorsetzen (dock in the port of Hamburg) to the selected Kajes (berths of cargo carriers) and dropped off there. There were 60,000 dockers back then. Tallymen, storage workers, dockers, deckhands and crane operators. All this can be experienced very well in the Hafenmuseum in the shed 50 in Hansa harbor. 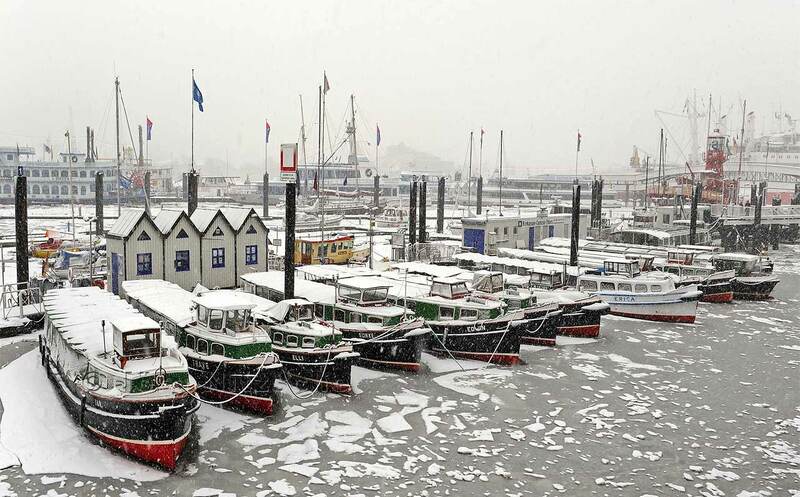 In winter, the harbor offers completely new impressions. 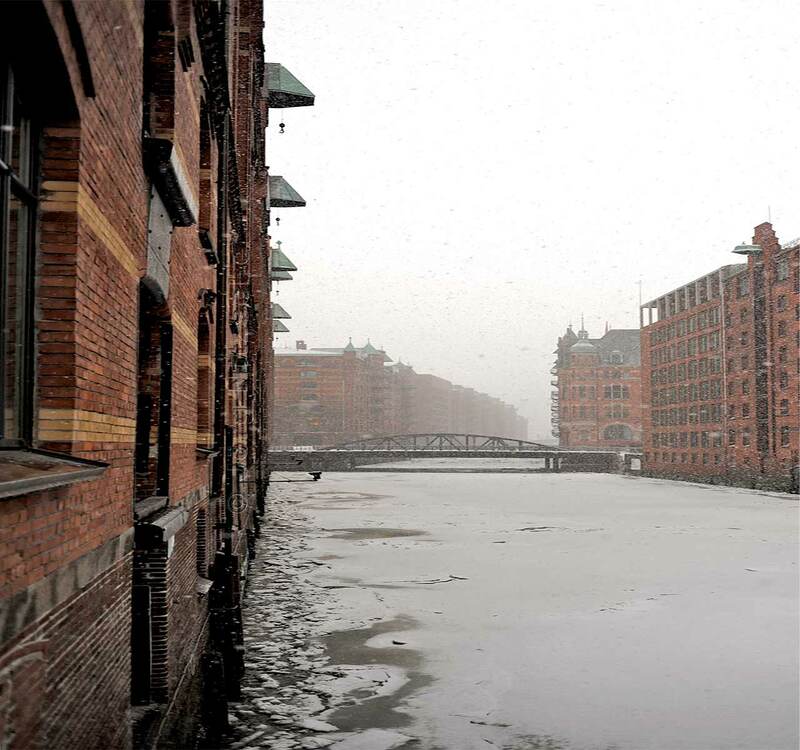 In Hamburg, the world is in order even in the inhospitable months. The chafing people thus extinguished the goods of the sea-going vessels, and partly loaded them on the barges, which, taken over by the Ewerfuhrers, then they were towed to the warehouses and warehouses, partly to other ships. The many small barges and Ewer (sailing freighter) were a commonplace in the Speicherstadtfleeten. Later, when the harbor spread to the south side of the Elbe, tugs were used. The more the tugs and larger barges prevailed, the lower became the importance of the Ewerführer as a trained skipper. In the Speicherhausfleeten, the barges were originally moved by muscle power. These barges have either grazed their barge (moved by reciprocating a rudder blade) or with a peek hook (with a long, wooden rod with an iron point and hook you have repelled the boat or it on the embedded rings or metal rods of the quay walls (which are still very well recognizable today) or moved on piles. In the post-war period, which passed seamlessly into economic miracle time, one used the port steam tractors. 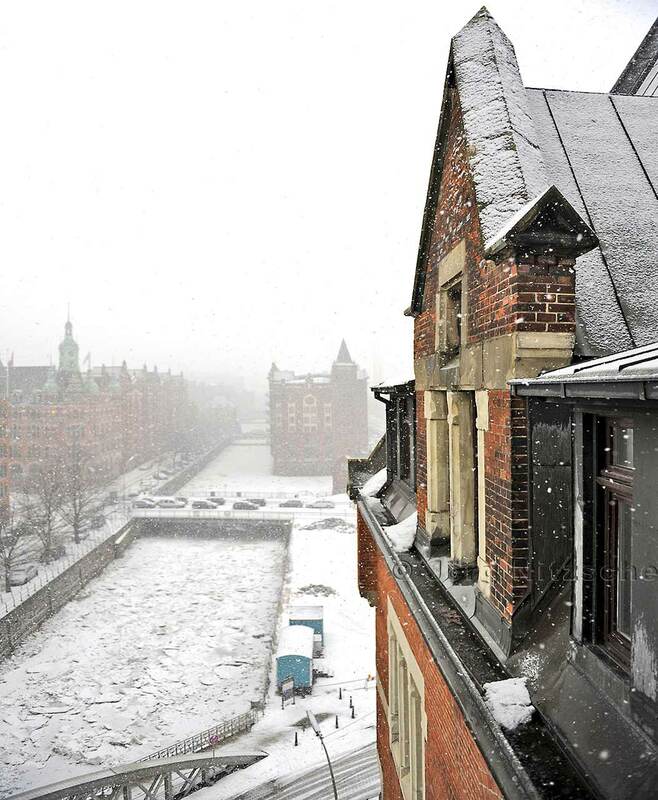 The Speicherstadt in winter and snowfall. . .
. . . an atmosphere to let thoughts wander. In the warehouse floors of the warehouse district, the stevedores were responsible for the goods. A so-called taximeter, a three-wheeled handcart and handcart were then the common floor conveyor on the storage floors. Since the triumph of pallets in the 1960s and pallet trucks were used, but preferably at the quayside. In the warehouses, the stacking of goods continued to be heavy work, as the storage floors were not suitable for forklift trucks. 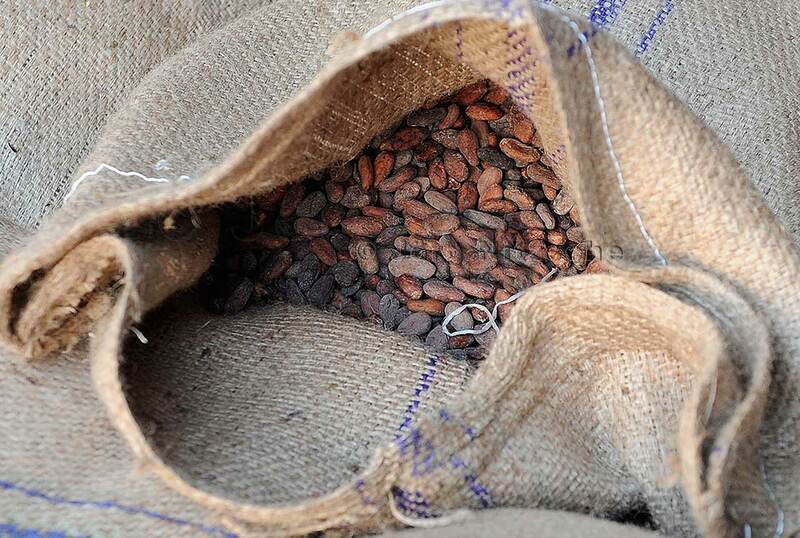 For cocoa and coffee, the standard bag weighed 60 kilograms. A winch was used to hoist the goods into the warehouses. The stevedores who operated the winch brought the Hieve to their feet and put them on the taximeter. With the taximeter, you involuntarily think of the meter in taxis. But here are the three-wheeled carts that were indispensable on the floors of the storerooms. On the other side of the storage building, ie the side facing the street, goods were again caught by the storage shelves (drained by a winch) and loaded onto trucks. Even horse-drawn vehicles came in the post-war period in the Speicherstadt many years as a means of transport in question. They often made goods for regional consumption in our city. To get a good picture of these times, it is recommended that the Speicherstadtmuseum be. There are really great tours and events here. The quay sheds, however, which are located on so-called Brooks, served on the other hand, the rapid handling of general cargo. The goods that were unloaded there should only remain in the quay sheds for a short time, so that they would soon be available again for the handling of the next ships. This was achieved by the staggered tariffs: The longer the goods remained in the shed, the more it had to be paid for fees. For the longer-term storage was the Speicherstadt, which belonged to the Hamburg Freeport Warehouse Company (1885 - 1939), but was leased mainly to the Quartiersleute. 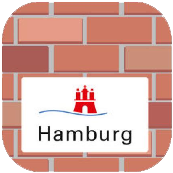 Hamburg Freeport Warehouse Company (HFLG) was founded in 1939 by the Hamburg Port and Warehouse Company (HHLA) and in 2005 the present Hamburg Port and Logistics AG (the abbreviation HHLA remained). 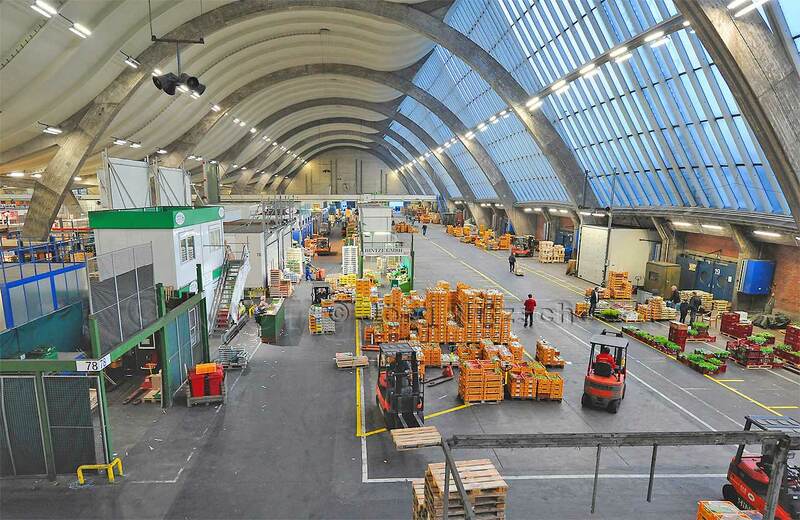 This warehouse G is located directly in Dessauer Straße (formerly Dessauer Ufer) at Saalehafen, not far from Schuppen 50. Also on the Dessauer Straße (Kleiner Grasbrook) HHLA owned several warehouses where goods were stored, which were not suitable for the Speicherstadt due to their large amount or certain security requirements, e.g. Cotton (because easily self-igniting). Furthermore, the HHLA took over the Kaispeicher A and B, which already existed before the construction of the Speicherstadt (today Elbphilharmonie and Maritimes Museum). 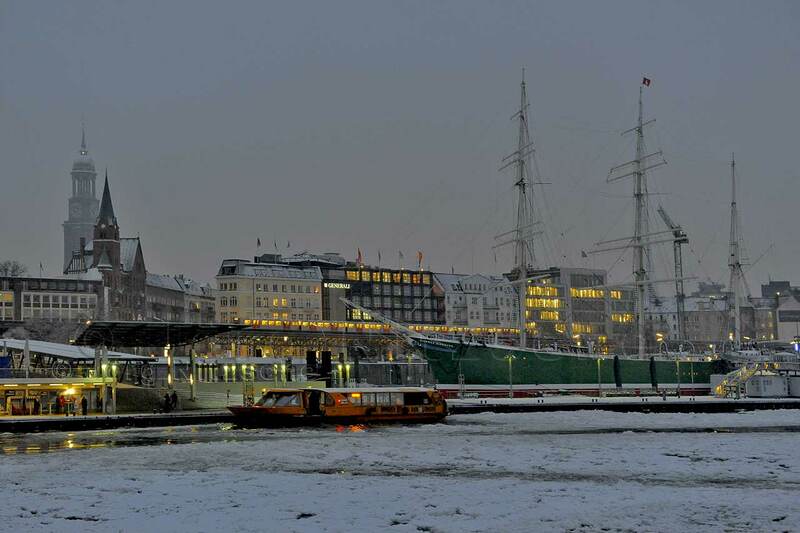 The first Kaispeicher A, the so-called Kaiserspeicher, was built in 1875 in the wake of the harbor reconstruction to plans by the water construction director Johannes Dalmann. 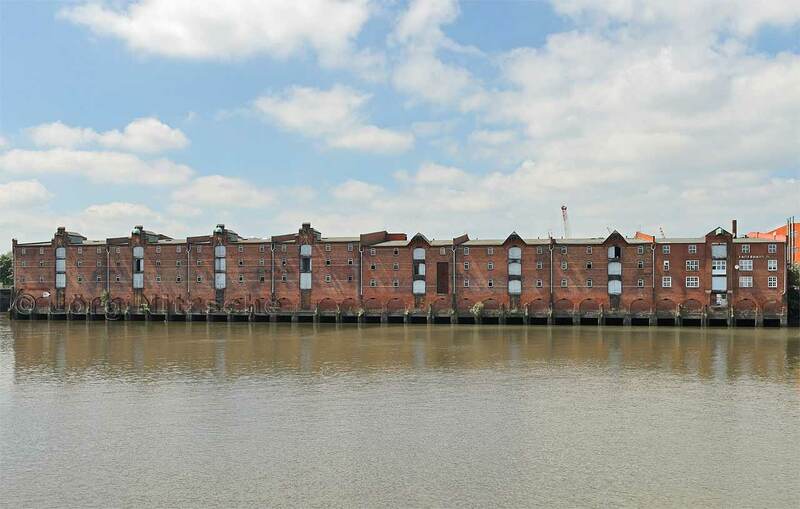 The brick building had a basement, a ground floor for goods handling and four floors for long-term storage. 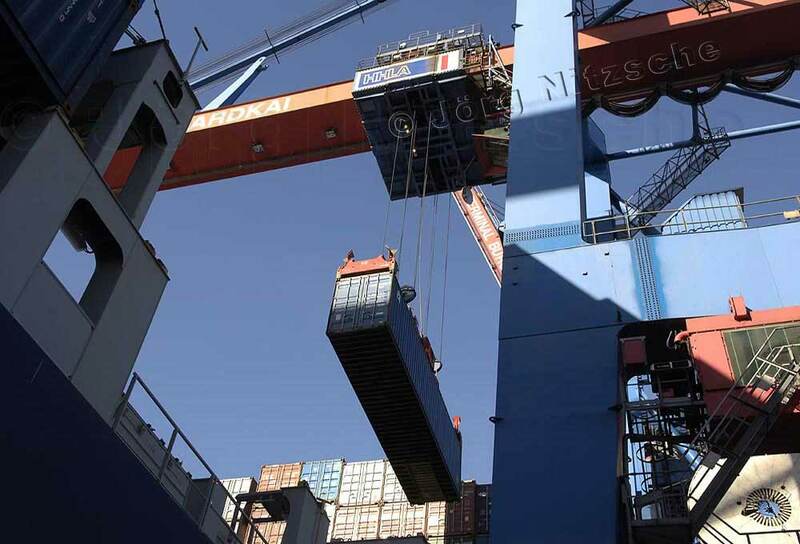 Both hydraulic cranes and steam cranes were available for loading and unloading. 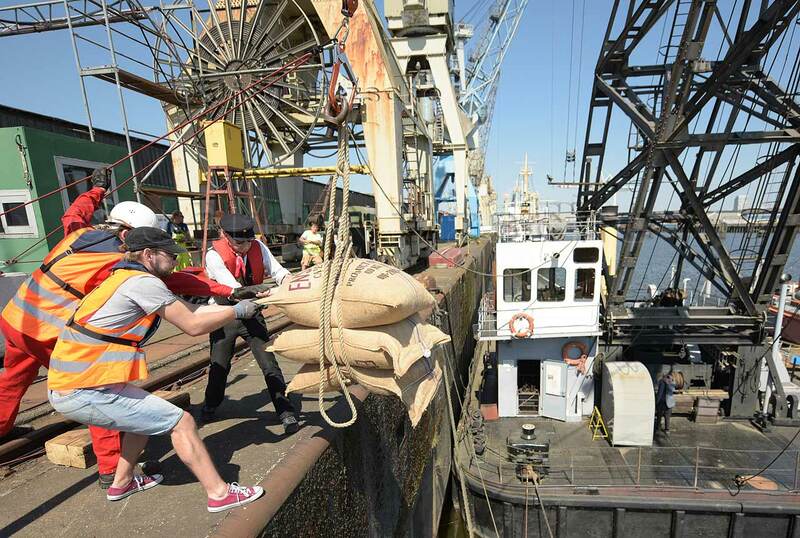 They were able to lift loads of up to 1.5 tonnes directly from ships in front of the hatches of the floors. The new Kaispeicher A was built in 1963 to plans by the architect Werner Kallmorgen on 1111 concrete piles. The piles have an average diameter of 50 centimeters and were designed to carry a weight of 160 tons each. The height of the Kaispeicher was 30 meters, with the glass structure of the Elbphilharmonie the building has grown by a good 80 meters. 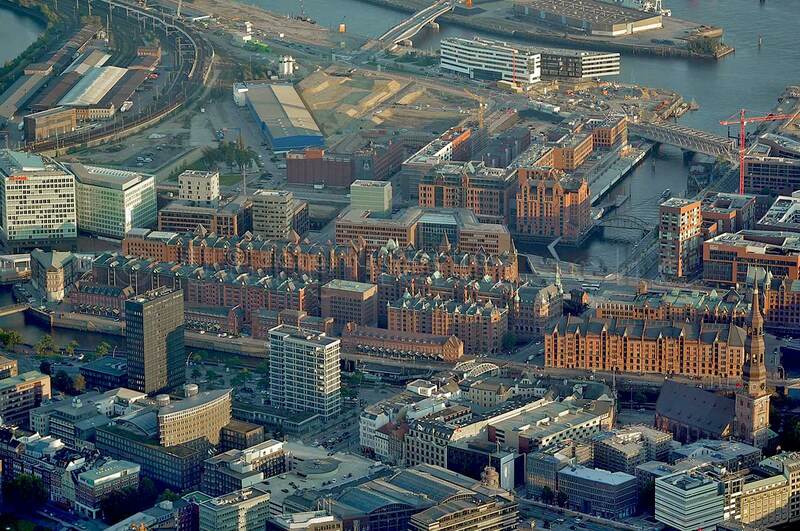 Today, the former Kaispeicher is the 110 meters tallest inhabited building in Hamburg. 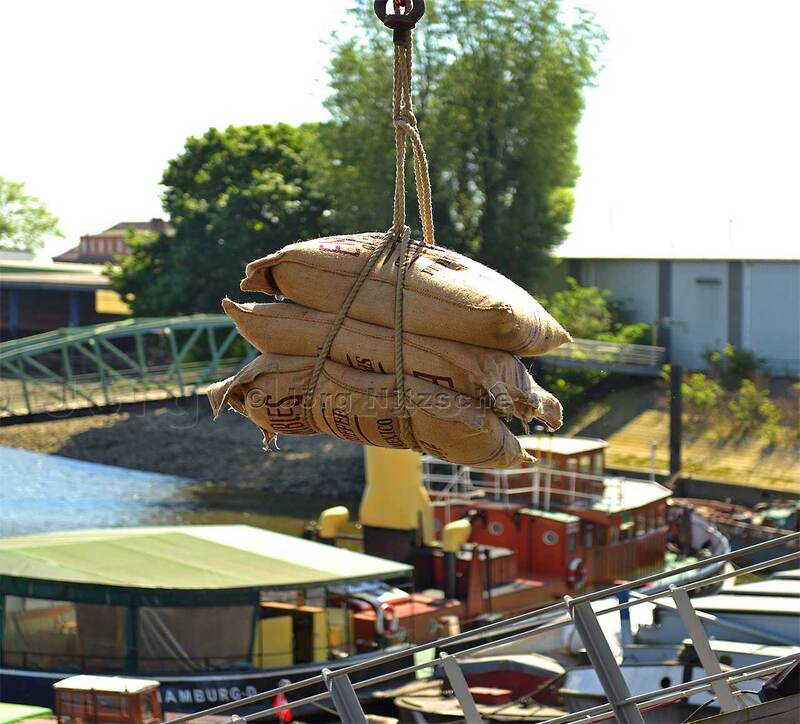 In the Kaispeicher A cocoa and coffee were stored from overseas, after the freight were cleared of the ships with large gantry cranes. In contrast to the buildings of the Speicherstadt, it was the only store that lay directly on sea-water. Today the music plays here. 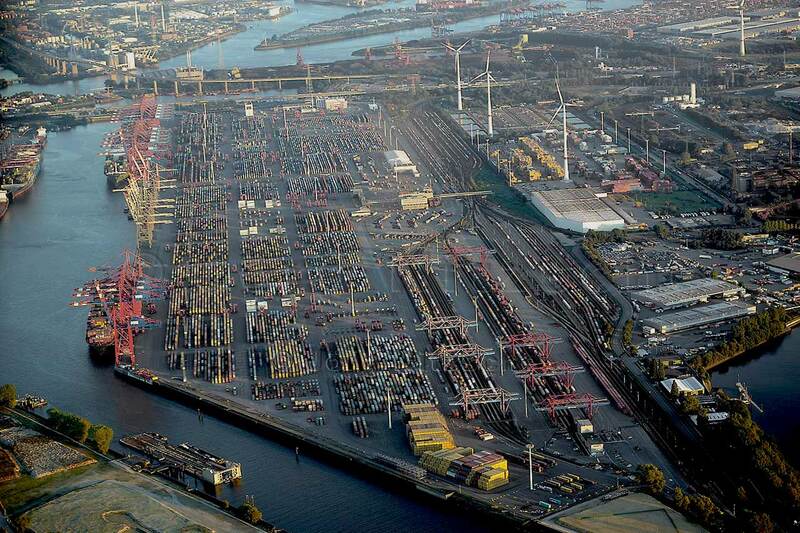 Until 1969, well beyond the economic miracle time, things got down to business in the port of Hamburg. With the introduction of the forklift in the 50s, although the first jobs were already eliminated, the development by the container market has been much more drastic. Container traffic has almost completely replaced the barges. As a result, the traditional profession of Ewerführers (scabbard) is extinct. 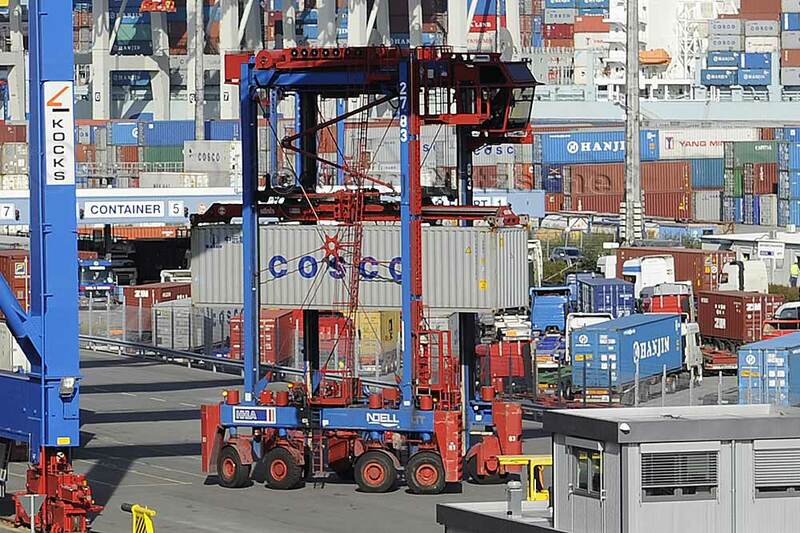 Today, there is an annual increase in container throughput in the millions. Large container ship is accompanied by tugs to the container terminal. The ship is deleted and loaded again. The high-legged Van carriers move the containers like busy bees to their predetermined places. It's unbelievable which logistics are behind this gigantic container landscape, which is barely visible to the general public. 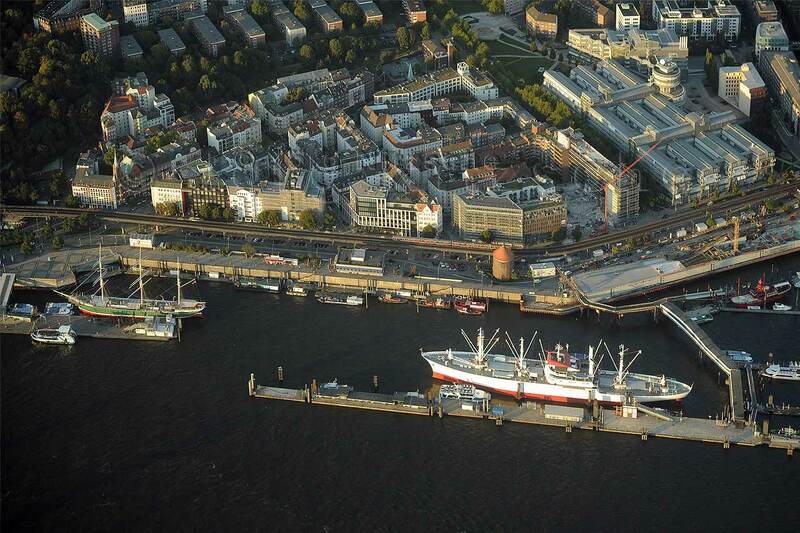 Here is the size of the terminals in comparison to Hamburg's old town. Large press casserole and enthusiasm when mooring in Hansahafen. 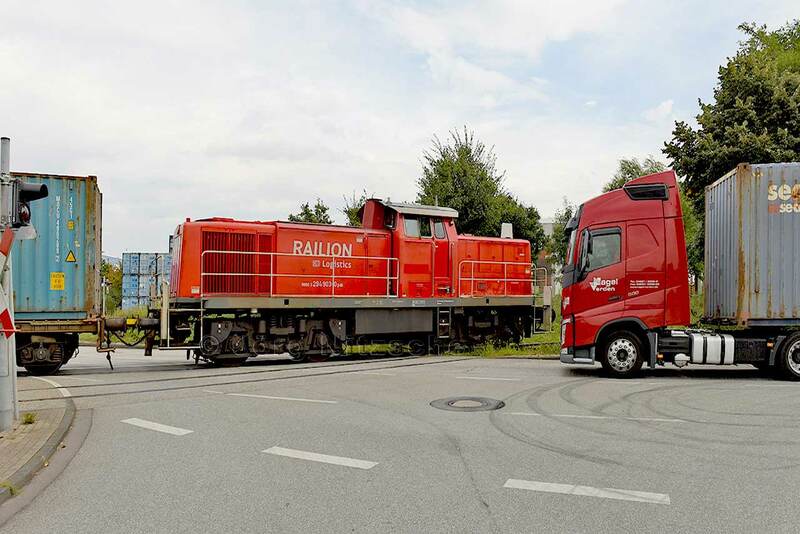 Further transports lead via the port railway, the truck and the so-called feeder vessels, which are reloaded directly from the container ship and transport goods to the adjoining border states. Feeder ships are like trucks on the water and can handle up to 300TUs (1 TEU equals a 20ft ISO container) to 2Tsd depending on the size of the vessel. 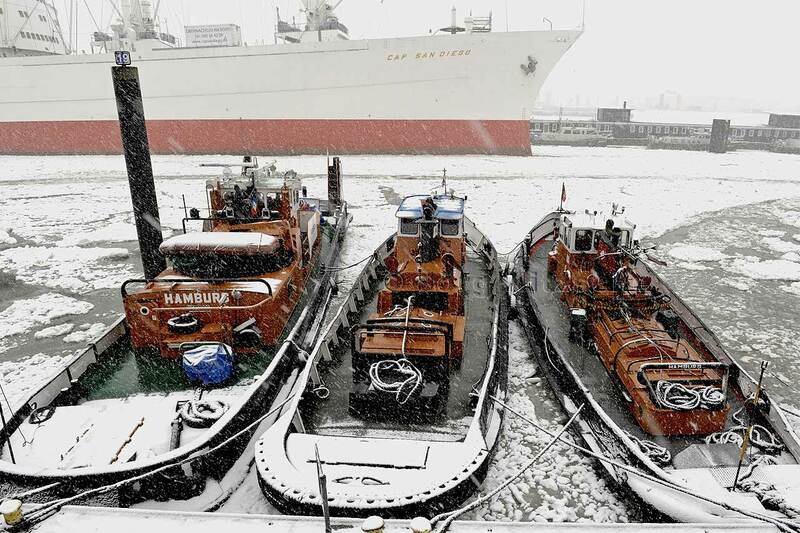 TEUs are loaded. So you carry a manageable amount of containers to smaller ports on, and drive, for example. to the Baltic. 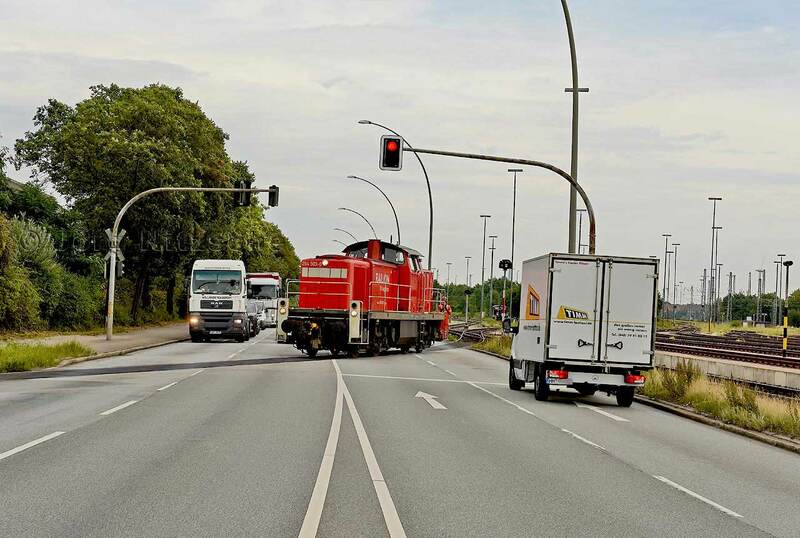 The Hamburger Hafenbahn crosses the street in several places in the Port of Hamburg. The port railway picks up containers from some shed. Again and again she has to cross the highway. Order has been completed. Cranes and computer-controlled machines take over the loading of goods and displaced so many hands of labor. 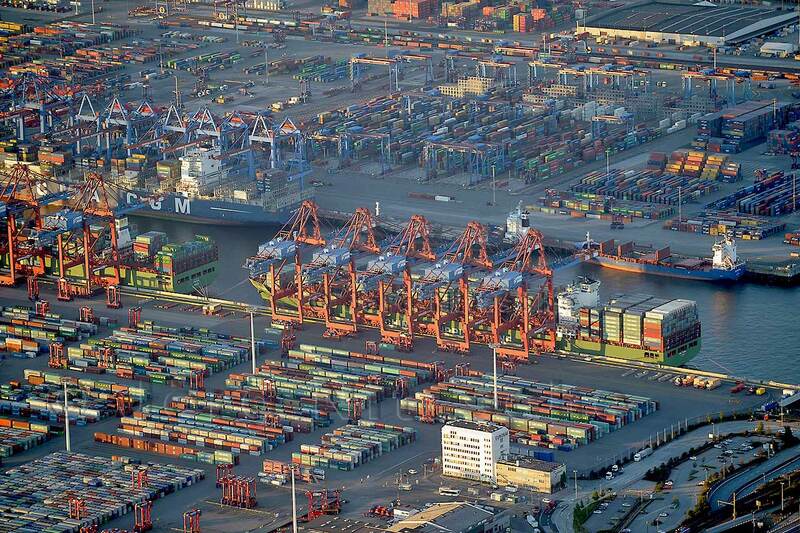 The new Port of Hamburg thrives on speed. More and more goods have to be handled and reloaded in ever shorter time. Fully automated processes largely replace human labor. 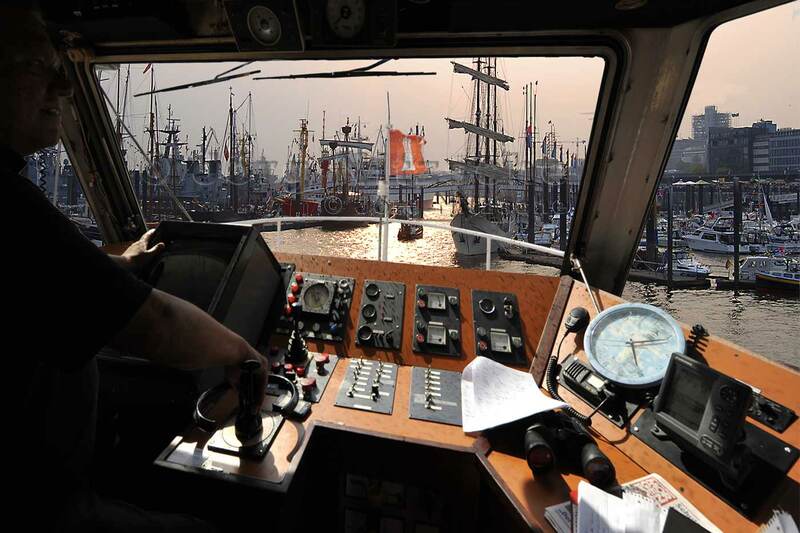 Many traditional and unusual, but for the port area very specific professional names such as: Quartiersleute, Tallymann, chill people or stevedores have become today the harbor skilled workers. 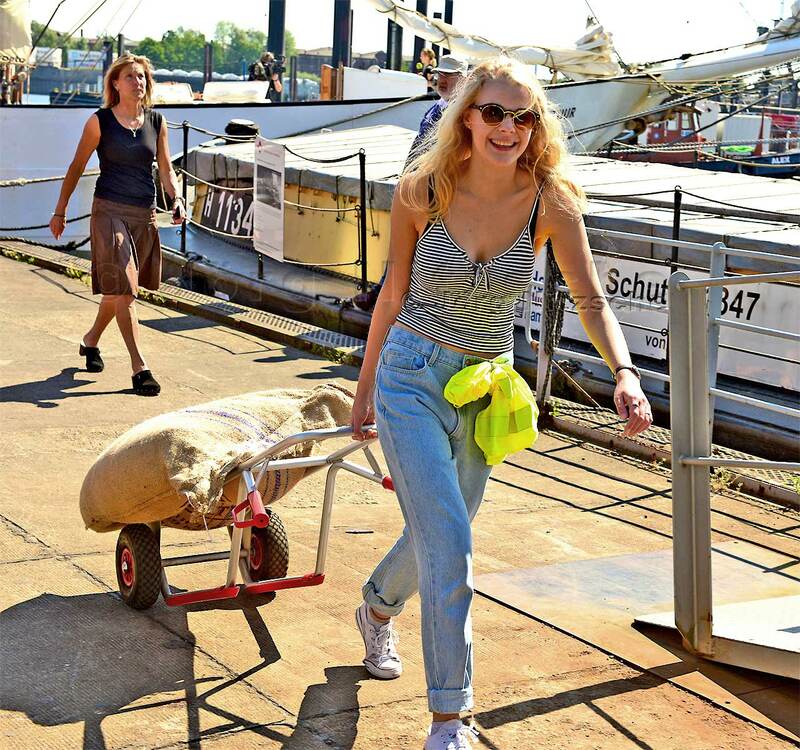 Hamburg's environmental partners are tackling this trend! We are in the 21st century. All of Hamburg is overshadowed by this trend. All of Hamburg? No! An initiative populated by indomitable people does not stop this activity To resist. And they take a lot of effort to deliberately resist this progress madness. For example, the climate-friendly ship transport company "Timbercoast", which campaigns for alternative goods traffic. 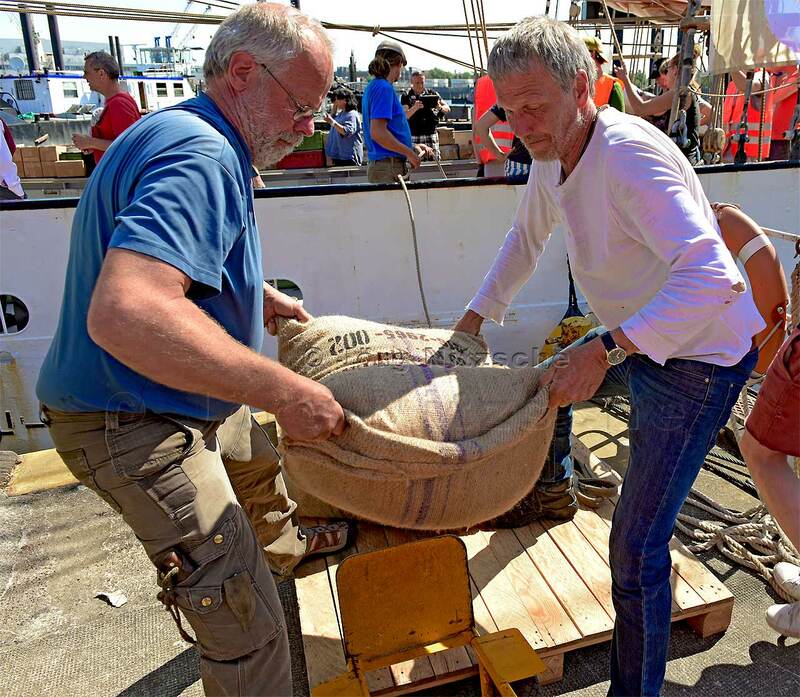 "With wind instead of heavy oil" is your motto and you demonstrate with their sailing freighter "Avontuur" that it is possible to transport products also clean over the seas. So far, little has been done to reduce CO2 emissions in shipping, with about 90% of world trade done by sea. Large press casserole and enthusiasm when mooring in Hansahafen. Of course, historic cable winches are also used here in the museum harbor. There is a lot of emphasis on manual work. With great commitment, all involved went to work. 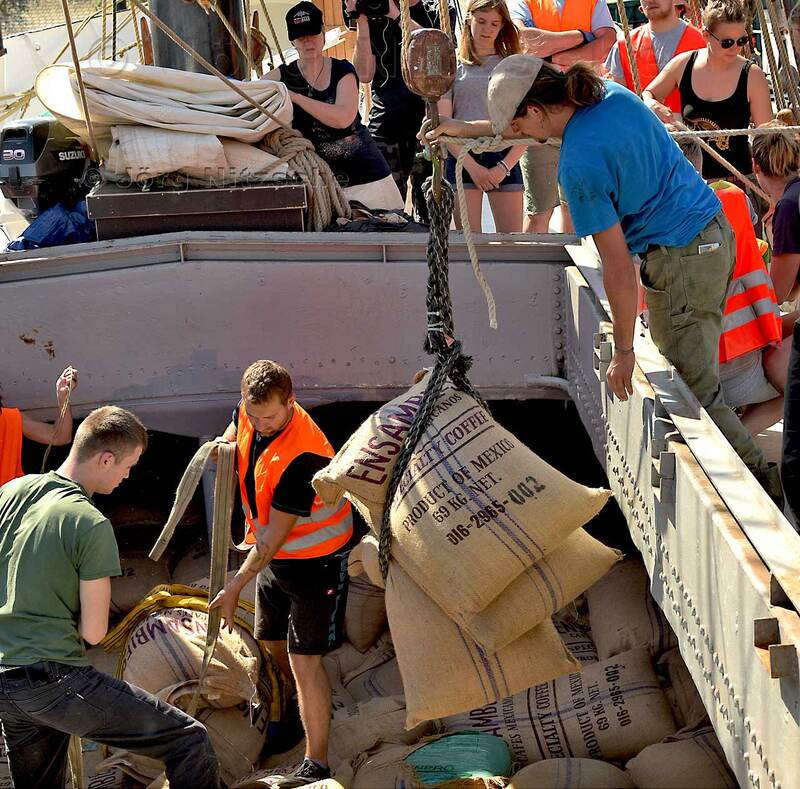 Like almost everything, coffee is transported on huge container ships today, but they want to propagate emissions-free against this development. 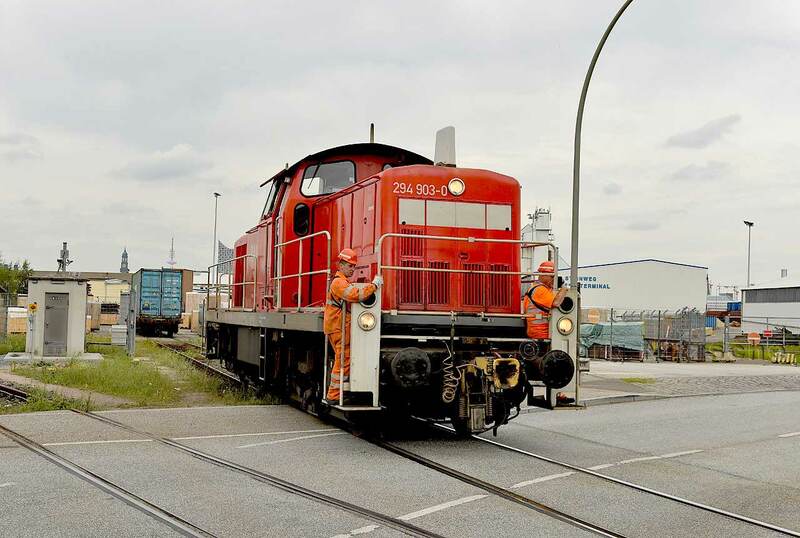 It has been over 30 years since cargo was finally unloaded by hand at Bremer Kai (Schuppen 50 and Hafenmuseum). With 30 t of loaded cargo and just under two months' journey, the Avontuur arrived at this historic loading bay on 14 May 2018. 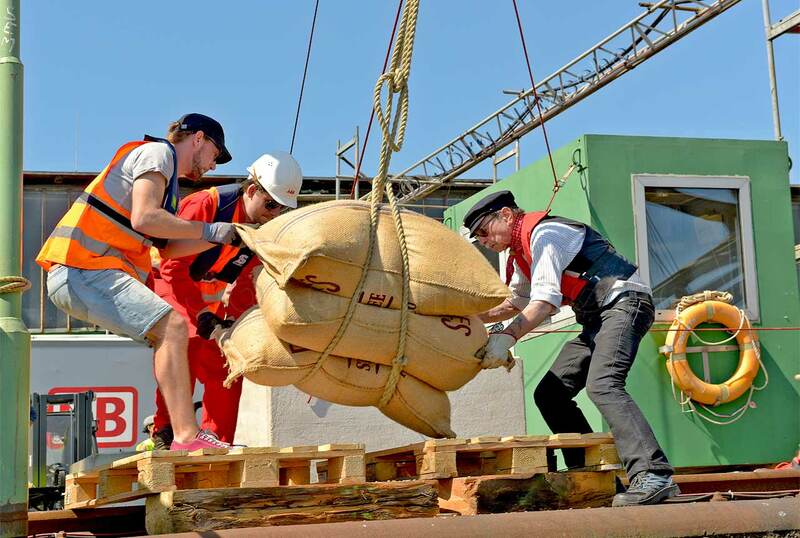 Of these, 10 tons are cardamom for "Yogi Tea", 18 tons of organically grown and fair trade coffee beans for "El Rojito" and 1.5 tonnes of cocoa beans for the Austrian chocolate manufacturer "Zotter" traditionally removed manually by many volunteers by hand. Students also volunteer to delete the cargo . . . . . . and, as you can see, also had a lot of fun at work. With cable pulls, the sackware finally becomes . . . . . . hoisted on the Bremer Kai. Also on land it goes on sustainable. Cargo bikes from tricargo, Ahoi Velo Cargo Bikes and El Rojito, which can load up to 300 kilos, The coffee and cocoa beans were transported to the interim storage facilities in an environmentally friendly way. Timbercoast will continue to do so in the future. It would be desirable if this traditional movement of goods had a future and so further sailing freighters could be put into operation. Professional lacing of the piece sacks is the top priority here. Nostalgic memories awake at the sight of the historic cranes in the background. 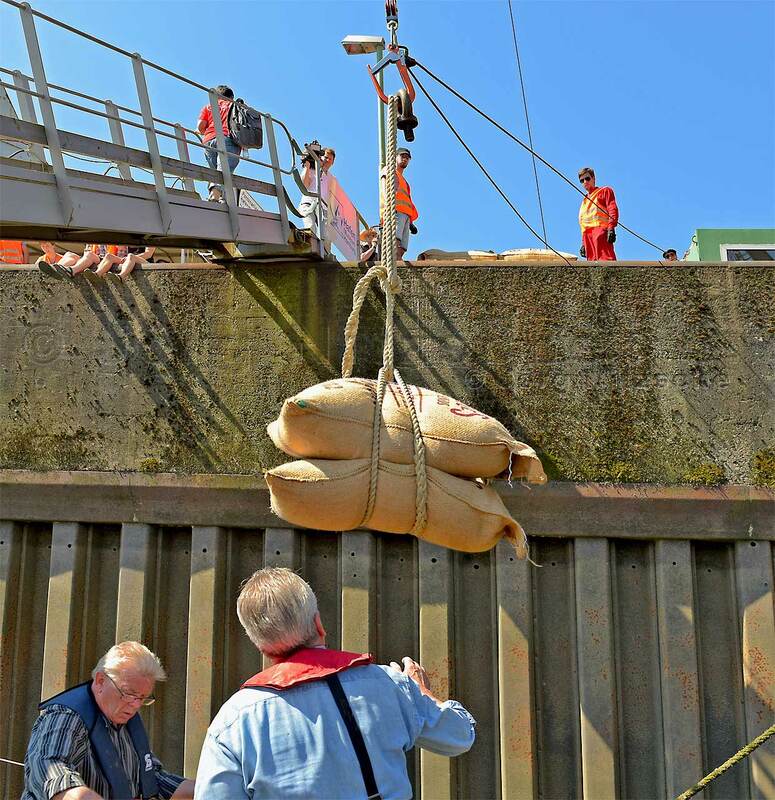 Finally the sacks are . . . . . . hoisted on the Bremer Kai. Already for 15 years, "El Rojito" has been transporting its coffee exclusively with cargo bikes through our city. 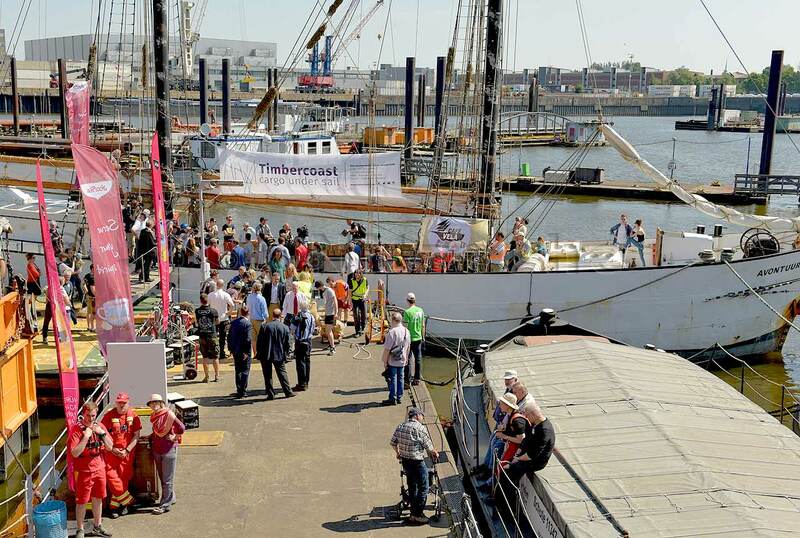 For his environmentally conscious commitment, the Hamburg club has now been honored by environmental senator Jens Kerstan at AVONTUUR as Hamburg's new environmental partner. When everyone pulls together, something big can happen. This event has also put former harbor workers, who are very committed to the harbor museum, in a state of wonderment. As a good example of a typical import goods, which was traditionally handled in Hamburg and also is still, I have chosen the cocoa. A product that probably knows each of us and actually every one of us uses in any way. Even in cosmetics, cocoa butter is processed. Already in the 19th century, many cocoa factories have settled here, because at that time Hamburg was the most important raw cocoa market on earth and the main entry point for this overseas product. For example, the cocoa company Theodor Reichardt in Hamburg-Wandsbek after the First World War under the direction of Friedrich Neumann-Reichardt Germany's largest cocoa and chocolate factory with up to 4,000 employees. 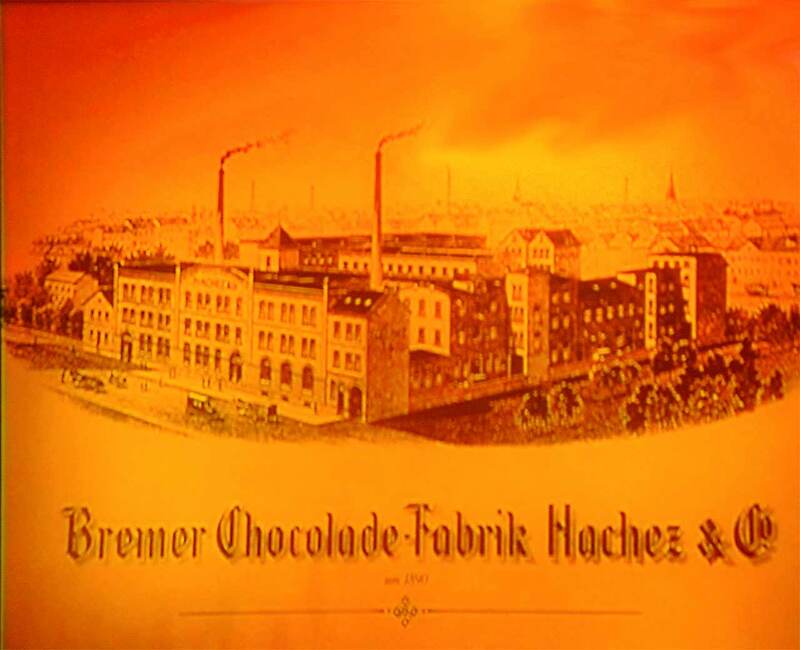 The cocoa company is no longer available, but chocolate is still produced successfully in Wandsbek today. In 1949, Herbert Stockmann started his chocolate production, now taken over by the famous Nestlé Group and today it is the largest Nestlé chocolate factory in Europe. But until we come to the delicious enjoyment of chewing chocolate, the whole thing has gone through a complex process. 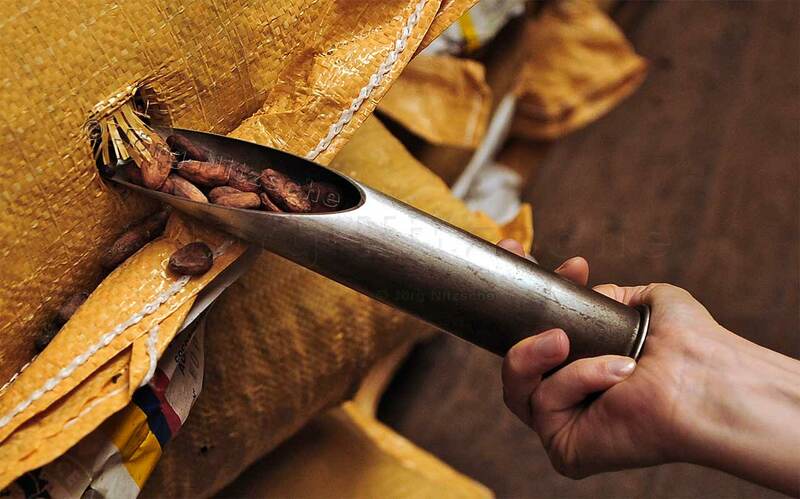 First, the harvest, fermentation and drying of the cocoa beans, which still takes place in the country of origin. 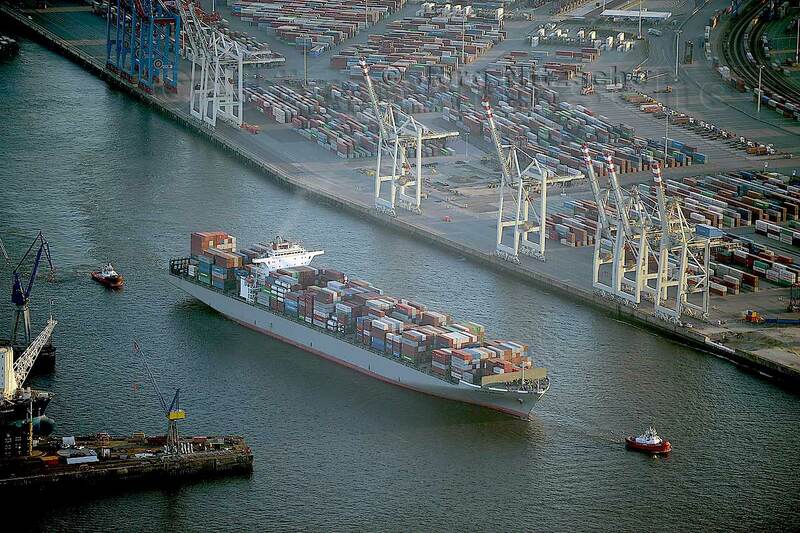 Then the transport over the seas comes to the port of Hamburg. Depending on the quality, the cocoa beans are either loaded in large bulk carriers (also called bulk carriers or megabulkers), a ship with 3 or 4 huge chambers (with a cargo volume of 15,000 to each chamber), or they come as bagged goods with precise type identification in containers loaded in the port of Hamburg. The containers with bagged goods are picked up on conventional container chassis by truck from the terminal and driven to the warehouses. 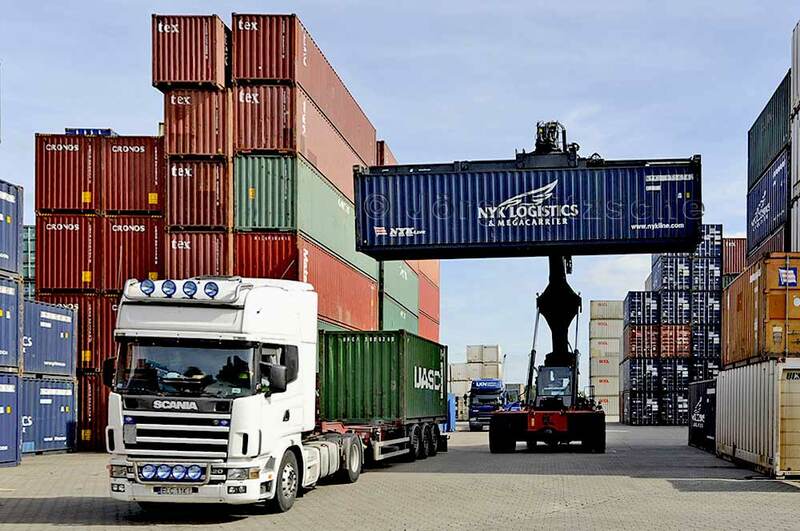 The truck can start again and pick up the next container from the terminal while the delivered container is already unloaded. 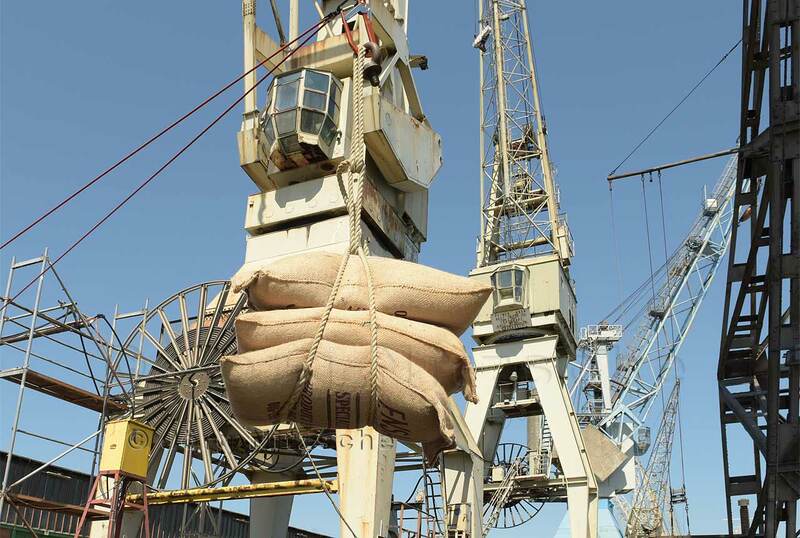 Since the sacks are stacked loosely in the containers, they are still stacked inside the container by 2 sack-beaters on so-called port pallets. Always 15 bags with a filling weight of 60 - 70 kg on a pallet. Then comes the quality control and storage of this luxury goods in the halls. Even in the large warehouses it smells pleasant sweetish, and it can be already sniff the later chocolate. 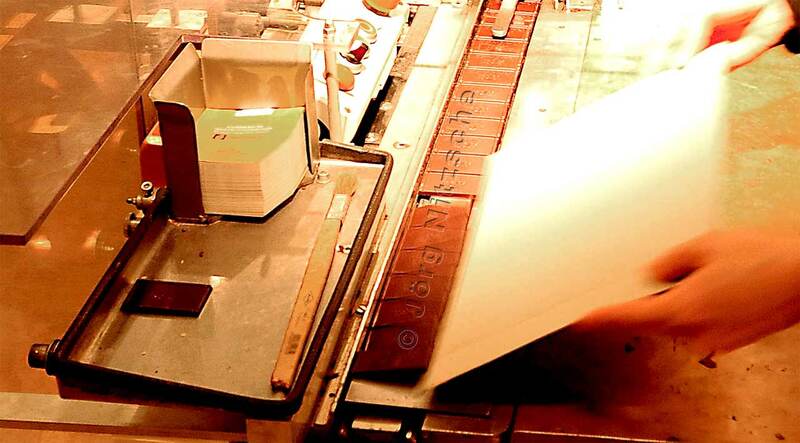 The subsequent processing until the production of our delicious chocolate is then once again a very special chapter, that is very descriptive in the Hachez Chocoversum in Hamburg can experience. After fermentation and drying in the harvest country of the cocoa bean they are filled in bags. 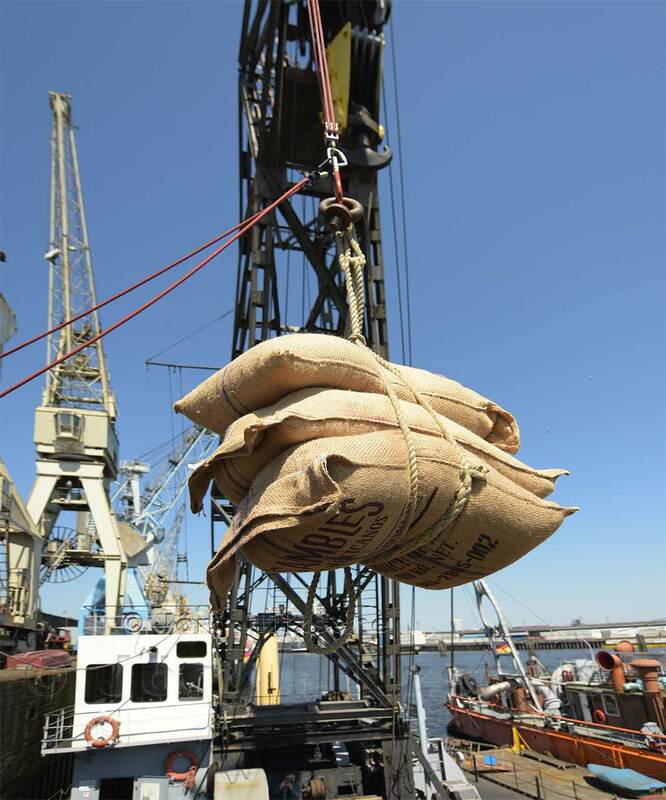 From the African countries comes mainly the bulk cocoa, which arrives as a bulk commodity in Hamburg. The higher quality cocoa, and therefore cocoa for its own sake is tasted, however, comes more from South America. Centuries ago, the first cocoa beans were said to have arrived directly by ship from the Aztec country in Seville, Spain. The means of transport is unchanged until today, it takes place (almost) exclusively by ship. There are a few connoisseurs who can not resist carrying very fine cocoa by plane. The company Cotterell represent even today still something like Quartiersleute (storekeeper) dar. Thus, as one recognized the already mentioned dockers at their Elbe sailors, At that time, the job description of the Quartiers people was characterized by their typical aprons (called platen), which they constantly carried in the storage floors. Neighborhood people are, one must actually say, because the term is no longer exist today, independent warehouse keepers who inspected goods on behalf of third parties, cleaned, sorted and stored. And exactly these activities are still carried out by the employees at H.D. Cotterell. With their comprehensive knowledge of the goods and their experience in dealing with high-quality goods, they have always been an important link between port transhipment and trade or the processing industry. The Quartierslüüd were called not because they offered the goods a "quarters", but because they were traditionally grouped into groups of four (Latin quattuor = four), which were named after a Vormann, whereby the 3 partners firmierten as Consorten. The result then so beautiful company names such as Quast & Consorten, which are also specialized in cocoa. "The occupation of the Quartiersmann does not exist, however. Since 1976, various job descriptions from the port have been combined to form a "sea freight inspector". Cotterell also trains sea freight inspectors, formerly called Tallymen (Cargo Checkers) or Quartiersmen. The Quartiers people worked in the multi-storey floors in the historic warehouse district. And this is also true of the long-established Cotterell family, who until a few years ago were still working in the Hamburger Speicherstadt. 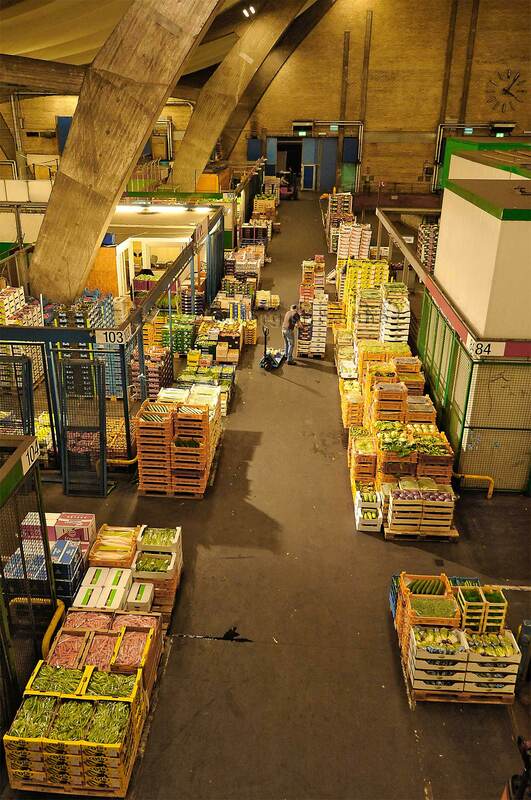 Today, however, not only because of the faster cargo handling, but also because the quantities have increased exorbitantly, the space in the floors of the warehouse district would not be sufficient anymore. The Cotterell family is one of the oldest neighborhood residents in Hamburg. Liverpool's Harry Dougan Cotterell was given 20,000 pounds by his father Harry. "Make something of it," said the merchant to his son. Harry Dougan Cotterell went to Hamburg in 1890 and founded the quartermaster company H.D.Cotterell in Sandtorkai in the then newly opened Hamburg Freeport. H.D.Cotterell, which until today stored relatively unmodified agricultural products from overseas, control and continue to ship. 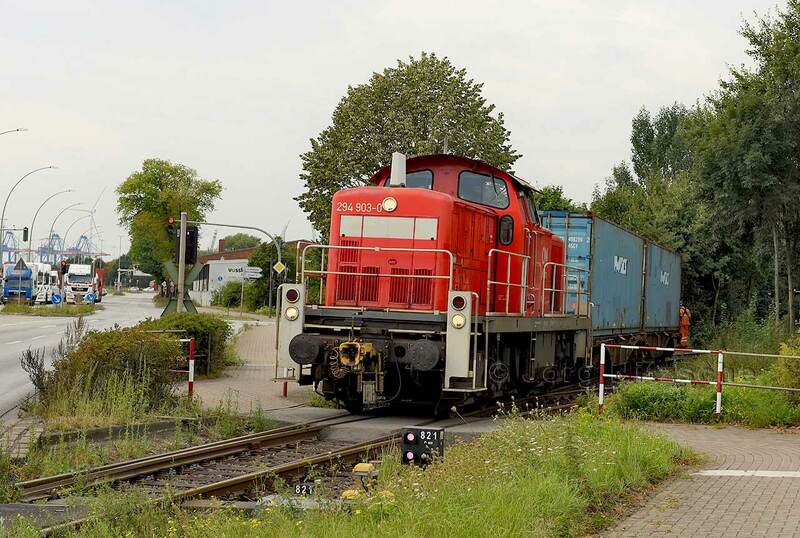 At that time there were favorable times, the customs connection had just been completed in the Hamburg Freeport and Hamburg overtook Antwerp and Amsterdam in the handling of goods. 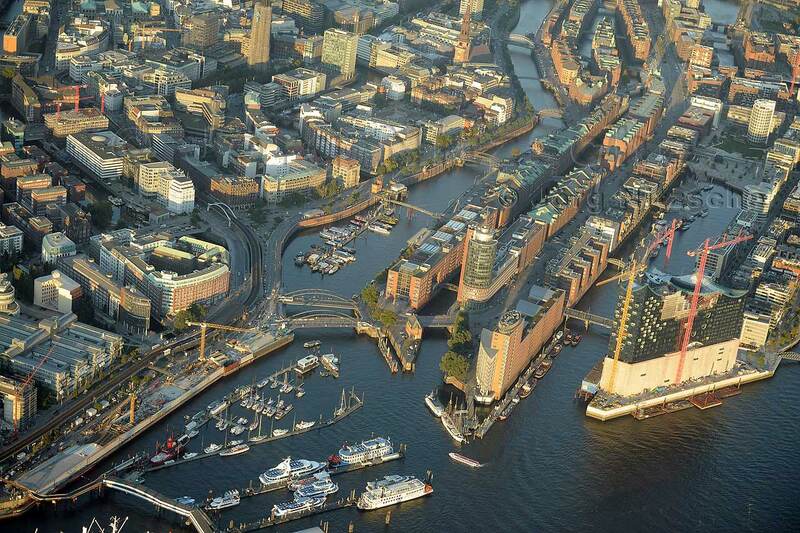 Hamburg stood directly behind London as an export port for industrial products and as an import port for colonial goods. The company stored and controlled cocoa, gum and wood, laying the foundation for today's business. Harry Dougan Cotterell married the Hamburg-based Ida Kranstöver, since then the Cotterell family is based in Hamburg. Still holding English citizenship, English origins became problematic in World War II, so that Harry Charles Cotterell decided to become German in order to continue the company in Hamburg. After the war, the company experienced stable and solid development for almost 20 years. In cooperation with the family branch in Amsterdam, the cocoa control business blossomed. The cooperation with Amsterdam was very close and culminated in 1986 with the joint establishment of a branch in London. 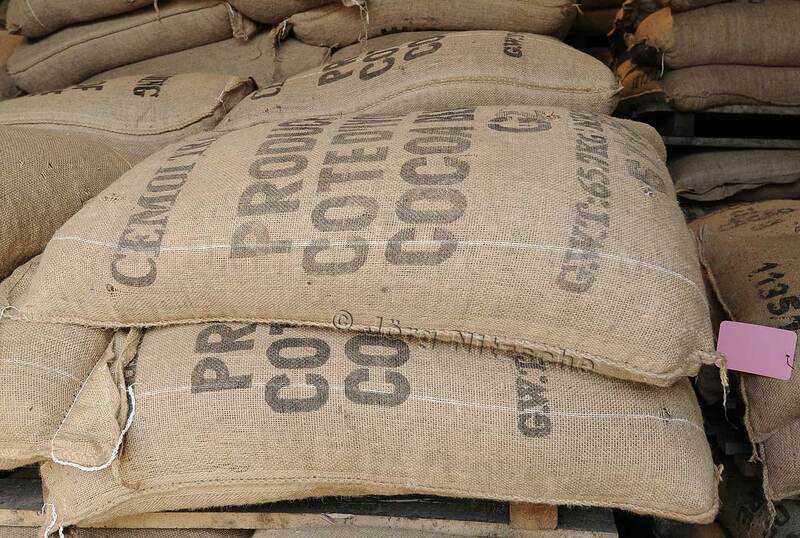 The cocoa control and storage business has added new commodities such as rubber, spices, dried fruits and harmless chemicals. With the acquisition of the storage areas at Ellerholzdamm the final extract from the Speicherstadt took place between 1995 and 1998. For heavy equipment such as forklifts and bulk material storage, the floors in the warehouse district were not designed. H.D.Cotterell is now managed by Thomas Cotterell in the 5th generation, after he took over the company from his mother in 2004 as the sole owner. He cares about the tradition. On the second floor of a hall he keeps old scales and sack trucks. 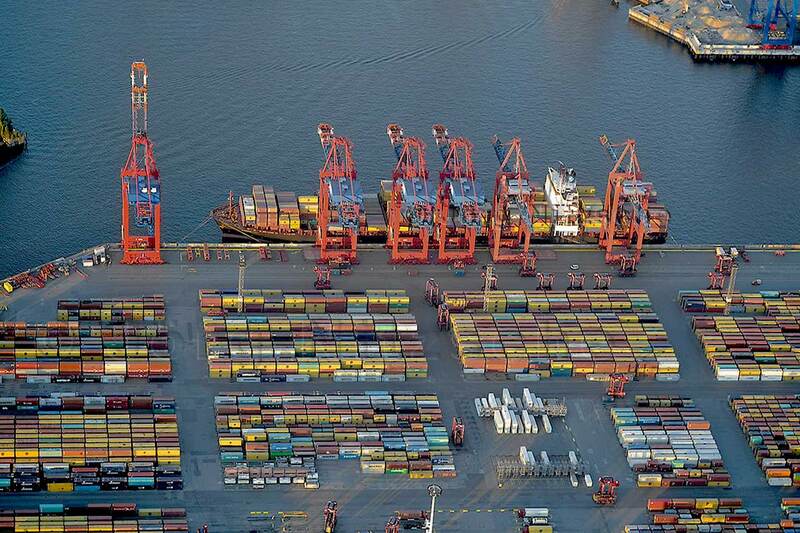 From its beginnings until today, the company has evolved continuously, but its core competencies are still those of as they did over 120 years ago - the control, storage, quality assurance and forwarding of goods in the Port of Hamburg. H.D.Cotterell guarantees the quality of proper storage. It has always been a tradition. In addition, they offer all their customers another service, namely testing cocoa beans according to specific regulations. Thus, H.D. Cotterell determines the quality of the cocoa beans as appraiser for exporters and importers still with hand, eye and nose. 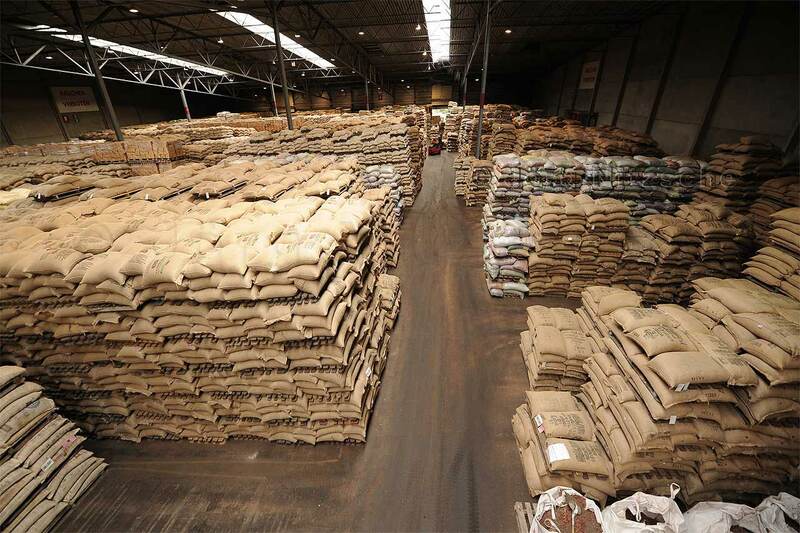 In their warehouses, huge piles of brown jute sacks are stacked with cocoa beans on pallets. 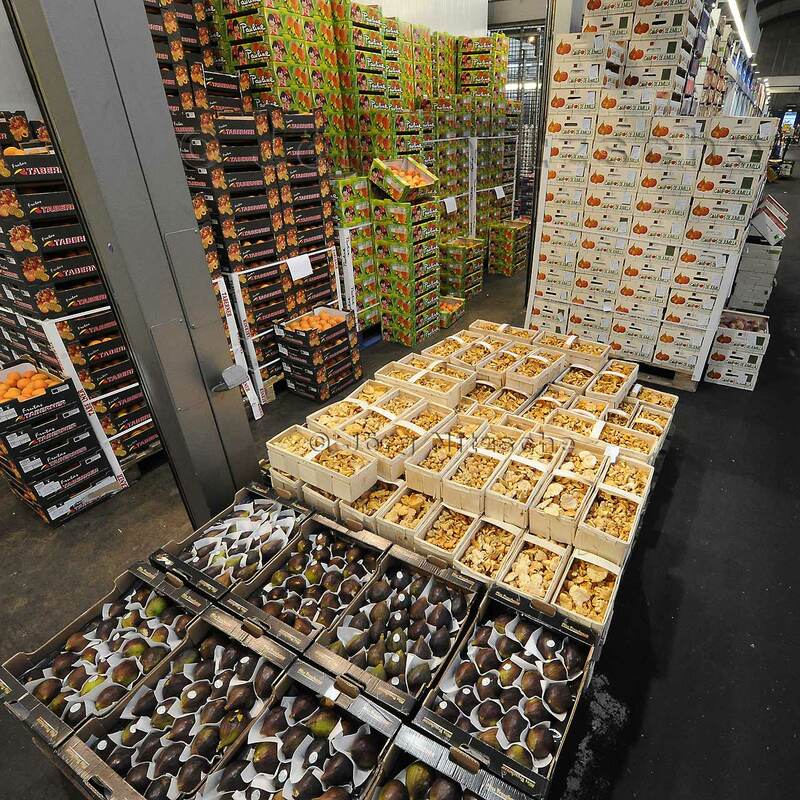 The bagged goods are packed on special port pallets and stacked up to 6 pallets on top of each other. A pallet with bagged goods weighs a good 900kg. Before that, however, the bags are patterned. 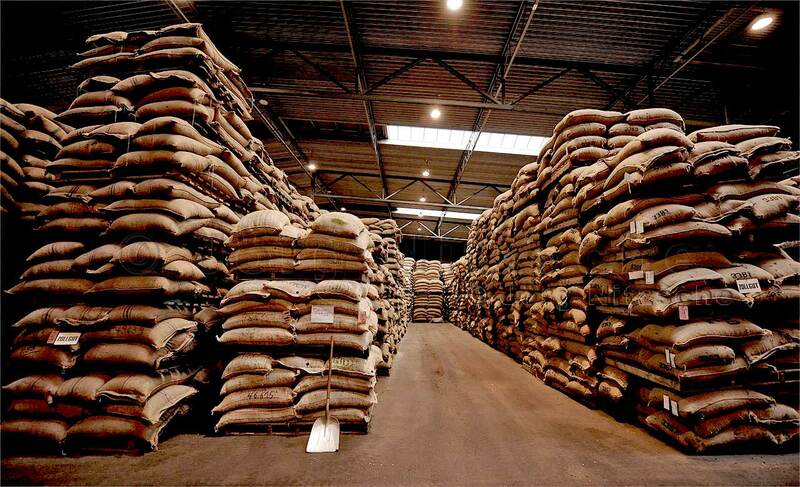 Bags that arrive with moisture-damaged beans are sorted out directly. Depending on the amount and severity of the damage, the customer always decides what happens to his cocoa. If a strong infestation of the incoming goods is detected, the lot (unless it is Bioware) fumigated immediately to prevent an increase in infestation. 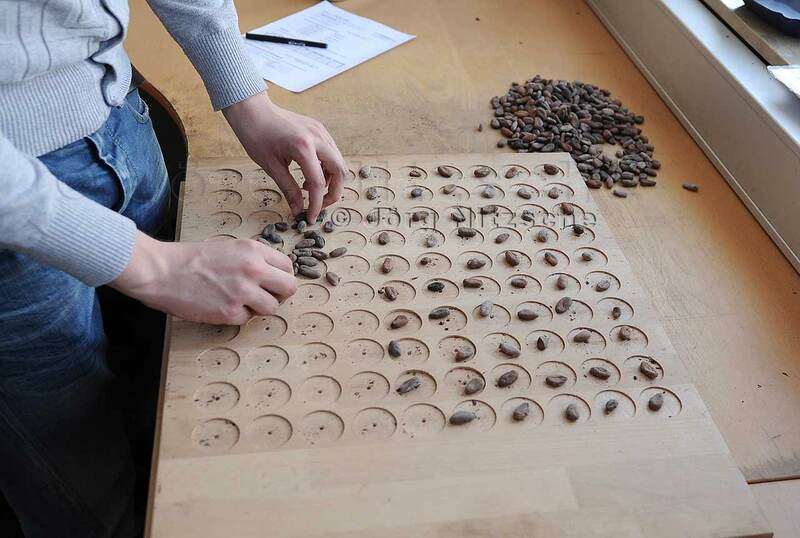 Depending on the instructions of the customer, the cocoa beans are tendered on the stock exchange, for which each 10 to lot lots must be named, put together and sampled every half a year. 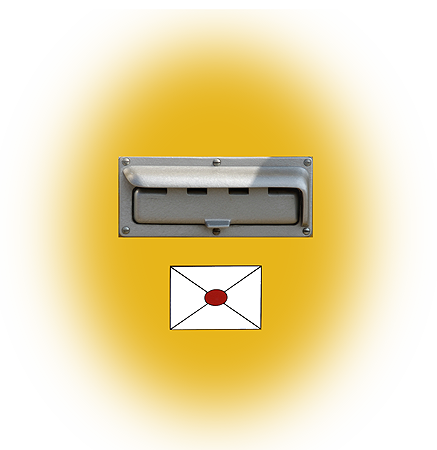 The assignment of the goods via so-called lot numbers and lot numbers. As loose bulk goods, the cocoa beans pile up in indescribable mountains in the halls in front of me and huge dust clouds are formed during loading. Hard to believe that these small red-brown, nut-sized cocoa beans are so much in demand raw material; that they themselves are highly traded on the stock exchanges of London and New York. The bulk storage compartments in the warehouse vary in size and each compartment holds between 150 to 10,000 tons of cocoa beans. 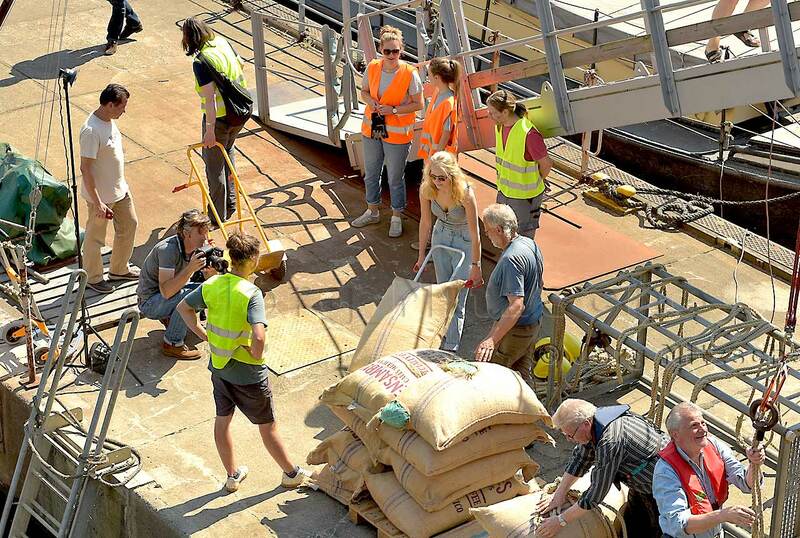 To find out the weight of the cocoa beans arriving here in Hamburg, The truck loaded with a full container is weighed on the weighbridge and, after unloading the contents, weighed again on the same scale. 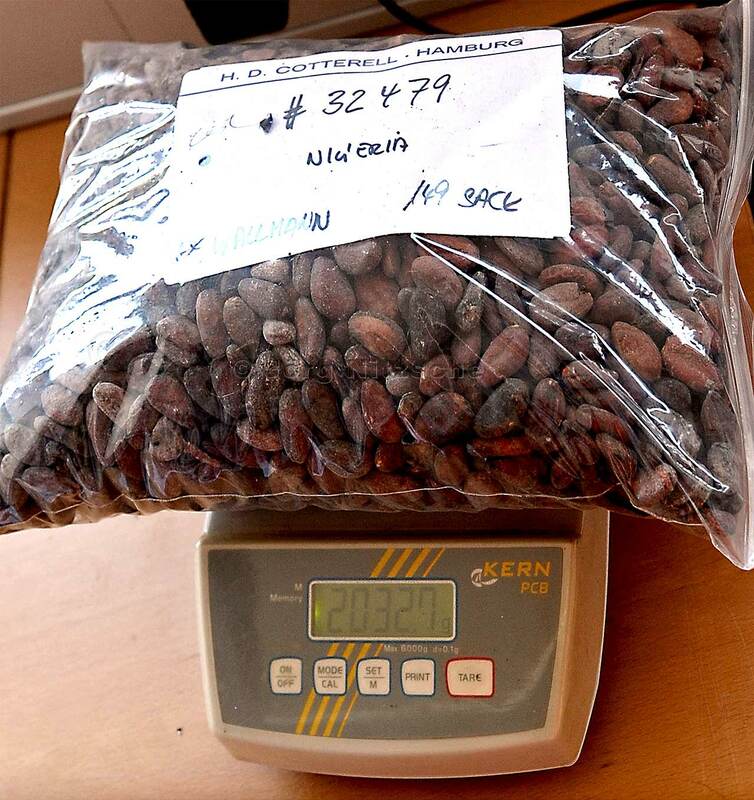 Since the weight during storage by further drying of the beans greatly reduced, the cocoa must be weighed again in the same way even at the time of delivery. In the case of storage, representative samples are drawn which on the one hand serve as proof of the overall quality of the beans and on the other hand of the direct quality analysis for the customer. Later samples requested by the customer are drawn, but are no longer representative, since the cocoa inside the pile has a different quality than on the surface. 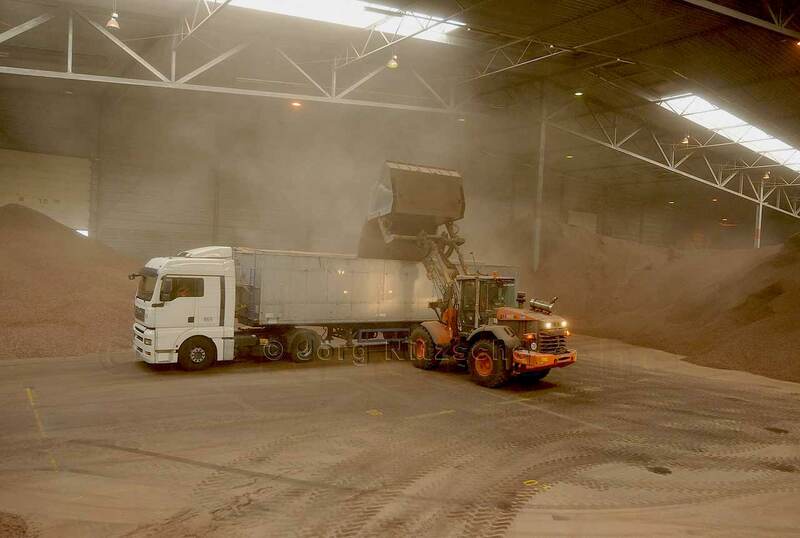 During storage, the temperature and moisture in the bulk pile are regularly checked as cocoa beans can develop such a high heat during the drying process (which never stops) that a fire could arise. If winter is here, then in the growing areas summer, ie main harvest time. Has the winter erupted a few meters north of the equator, while a few meters south of summer prevails? However, the countries of Costa Rica and Venezuela have the same seasons as we do, as we are above the equator. Hard to believe, because you really do not know winter, Well, was such a mind game. 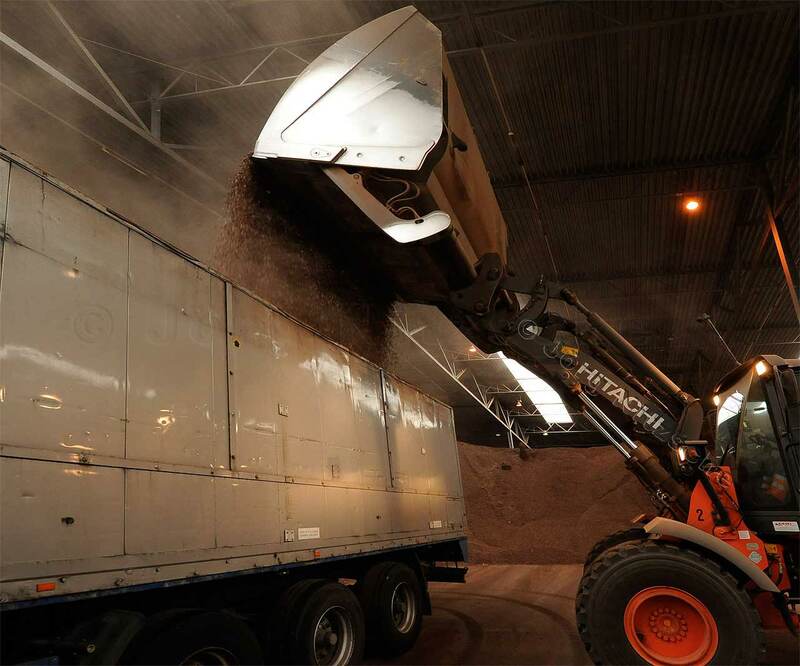 In any case, it can happen during the main harvest time that an overcapacity of stocks occurs and H.D. Cotterell must consider where to go with the cocoa. Sometimes, other warehouses in the port are then additionally stored, so that H.D.Cotterell itself becomes a customer who has to be stored. Bulkware should not be stored for more than 1 year, because the long drying time causes a large weight loss. The customer is then notified that the latter completely reduces its remaining quantity. 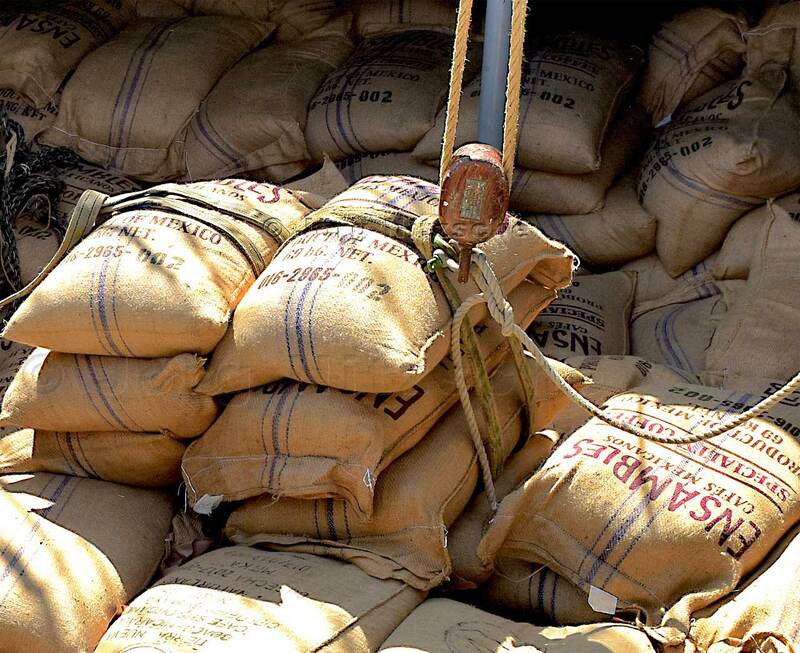 Cocoa beans in bags can also be stored much longer than 1 year. There are games that have been stored at H.D.Cotterell for 20 years. Is rare, but that also happens. There are customers who have e.g. Only 20 sacks of cocoa beans stored here, they even came by plane from Santa Lucia, Uruguay. These are very special beans. One reason why, e.g. 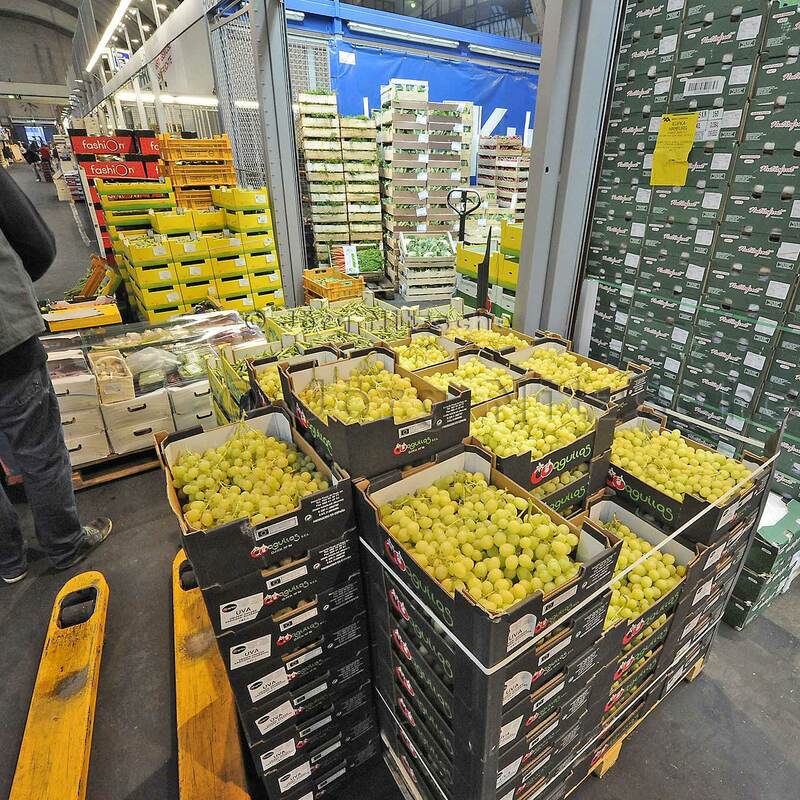 an owner sitting in England could not have his beans shipped directly to him, for example, that he does not yet have a specific buyer, but wants to sell the beans here in Germany. And these 20 bags were actually taken in even smaller quantities. On the way to storing the precious cargo, an employee from the cocoa warehouse drills through the coarse jute fabric with the sampler and takes samples from as many bags as possible (about 30%). But generally, the customer determines how many percent of the sacks of samples are to be taken. 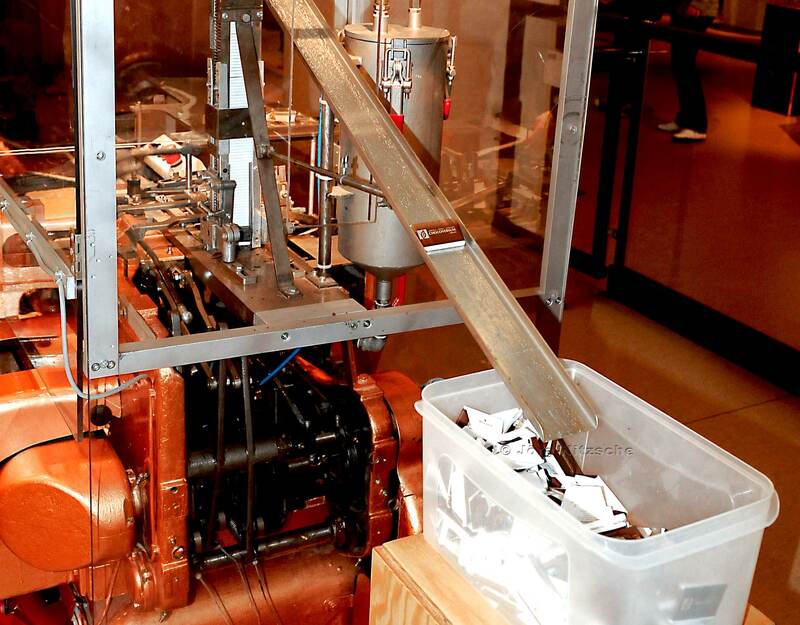 The cocoa beans are collected in a bag via the sample plug. 4 samples a'2000g net weight are collected via a sample devider. The reason for this procedure is that all patterns are representative and above all the same. - Number of bags that have been stored. These are not touched until the customer says we have a recipient here who says the quality is not as good as it should be. We want to have the pattern opened and analyzed to see what's going on there. At the same time, the customer also gets a sample. He can then analyze it himself. Again, customers determine how many sacks of samples are to be drawn. For example, a customer might say he has sampled 50% of his stock. 1. 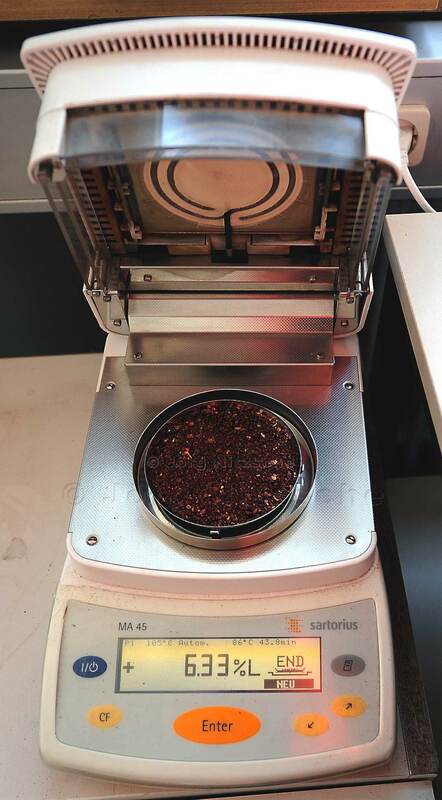 First, the 2000g sieved, so that some impurities such as sand, grass and small stones separated from the actual sample are. The collected impurities are disposed of. - and sorted by fraction. Each individual criteria material is weighed and the values recorded. 6 - 8% and is also entered in the FCC analysis log. 4. Now it's all about the beans. The separated pollutant is not simply poured away, but poured back into the sample bag. Of the whole beans are now weighed 600 g, the rest of the beans is also poured back into the sample bag. Now the number of beans from these 600 g is determined. The number of beans counted is divided by 6, and it's this sum that represents the beancount. The Beancount stands for 100 g of cocoa beans. Regardless of these 600g 300 beans are counted out and spread out on 3 cutting boards, Each of the 100 frozen compartments has 10 trays (10 vertical and 10 horizontal), one tray per bean. 100 beans on a board = 100%. So if 5 beans are damaged, that means a harmful 5%. But since it is a natural product, and you want to get a more accurate value, 3 boards with 300 beans are brought to the test. So it is finally expected from 300% to 100%. For this, each of the 300 beans is cut once completely lengthwise in the middle. This is the so-called cut test and is done completely by hand. The cut beans are preferably handled with gloves because of possible germs in damaged goods. The connoisseur sees with his trained eye usually immediately what is going on in or with the bean. I had to take a closer look around as to make out a purple color. However, if you have your eye calibrated a bit, you can already see quite clearly what is meant by violet. Is e.g. 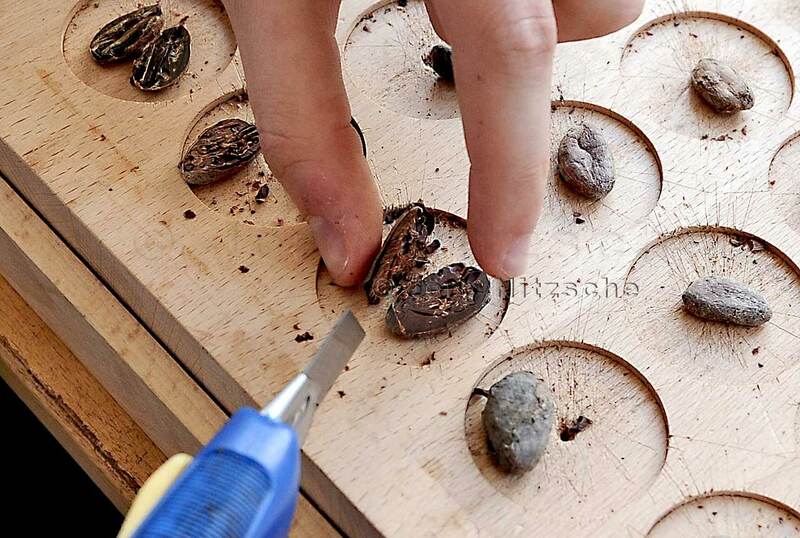 To make out mildew and also worm-eating in a bean, the criteria mold has priority. 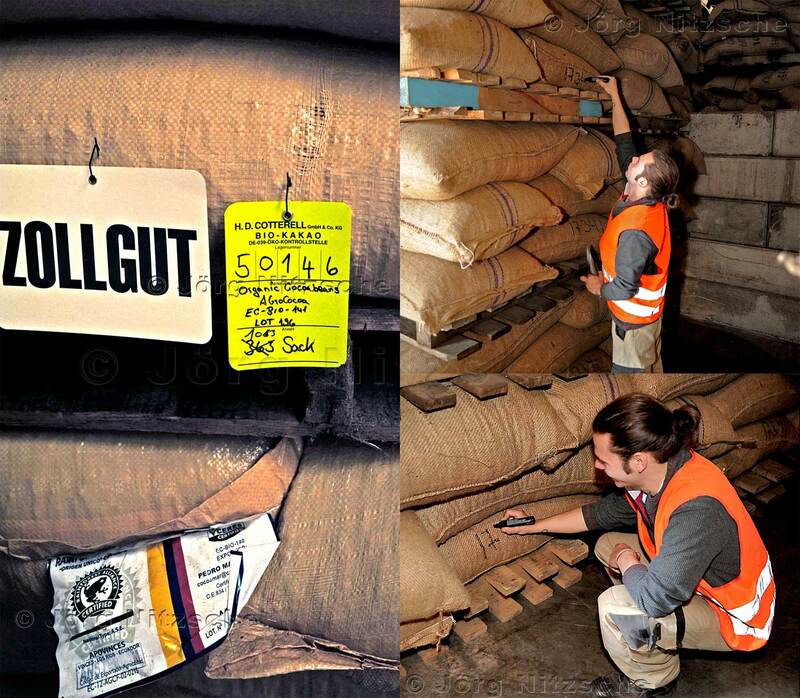 The beans are separated into small heaps according to these criteria and each heap is counted and recorded in the log. So here is not weighed but counted, because every single bean stands for one percent. 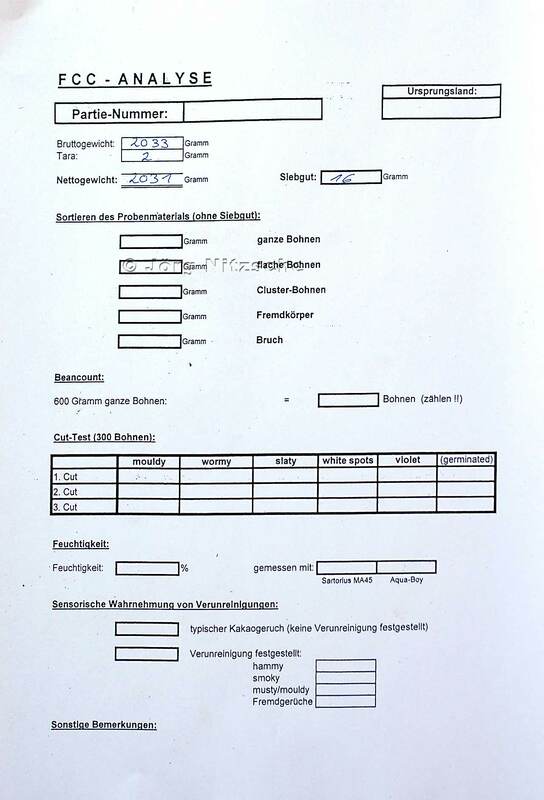 All recorded values are handwritten on the protocol sheet and entered again in the computer. The cut beans are completely disposed of after inspection. 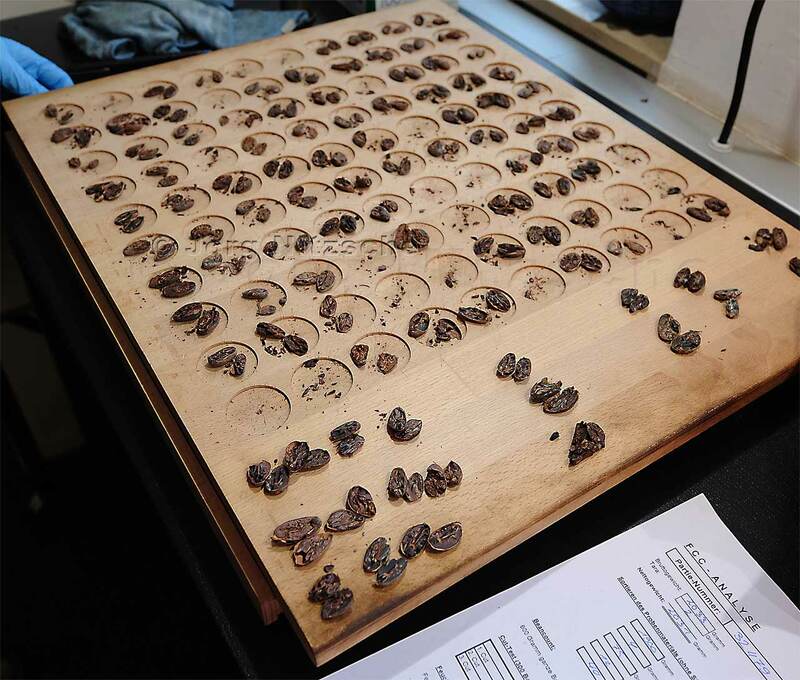 The remaining cocoa beans of the test sample, approx. 1400g, will continue to be stored in order to be able to reproduce the evaluation values over and over again. Some customers also want a fat level analysis. However, the existing sample must be sent to a Hamburg SGS Institute (Société Générale de Surveillance). 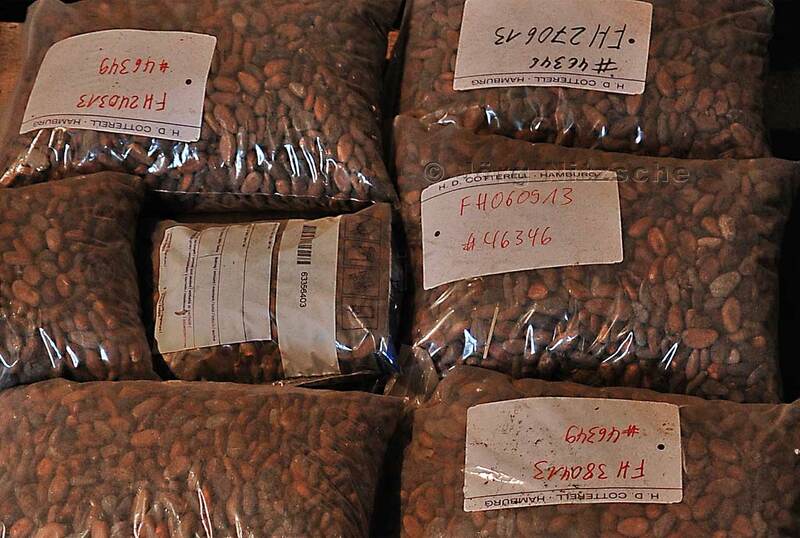 A customer wants to get a certain amount of cocoa beans from his stock! He could choose from 3 different ways of delivery. Variant 1: the delivery as bagged goods. 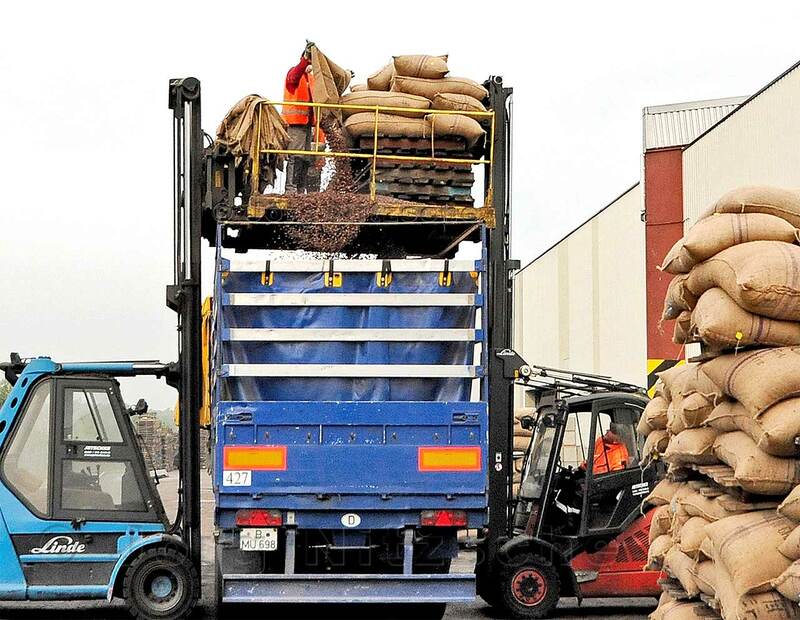 The sacks packed on port pallets are then loaded onto the truck with the help of a forklift truck. 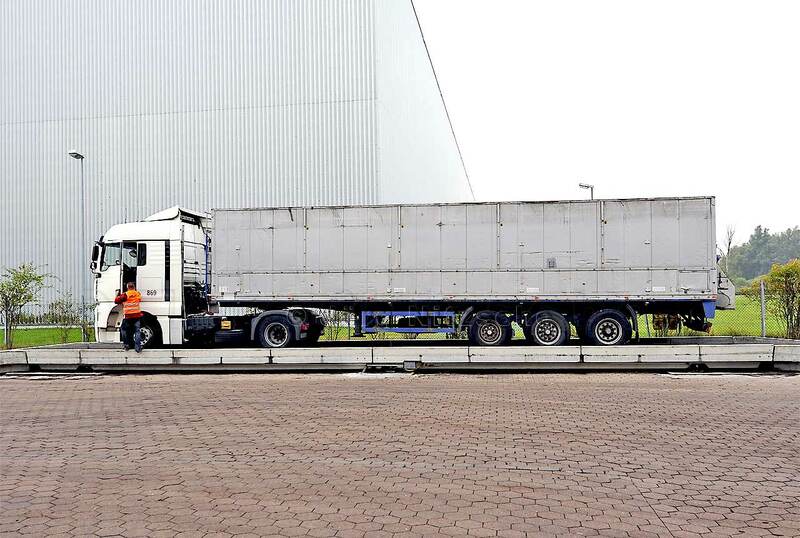 The customer also decides whether the truck is weighed on the weighbridge. Once empty and fully weighed after loading. Variant 2: the customer wants the delivery from a bulk heap. Here the truck is weighed out in any case. 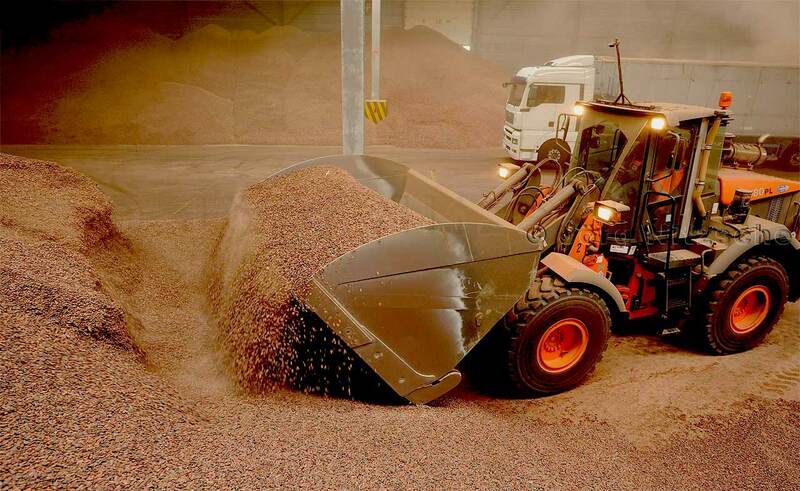 The loose beans are then loaded onto the truck using a wheel loader. It seems pretty irreverent to me, this handling of the basic material for fine chocolate. But probably this bulkware is not intended for fine chocolate. After loading, the truck is weighed again. Thus, the loss weight can be determined at emptying of the subject. Variant 3: The customer wants the delivery from bagged goods, but as a loose product, as a bulk. Again, the truck is first weighed out. A specially secured for 2 employees lift is lifted directly over the trailer of the truck. 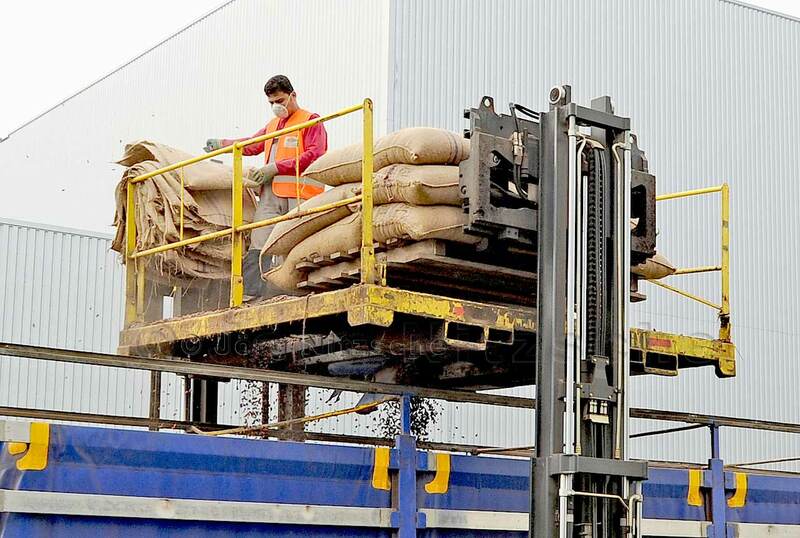 Sacks stored on pallets are lifted to the same level using a forklift truck and employees slit open each sack, so that the cocoa beans trickle directly into the hold of the trailer. Then the truck is fully weighed. 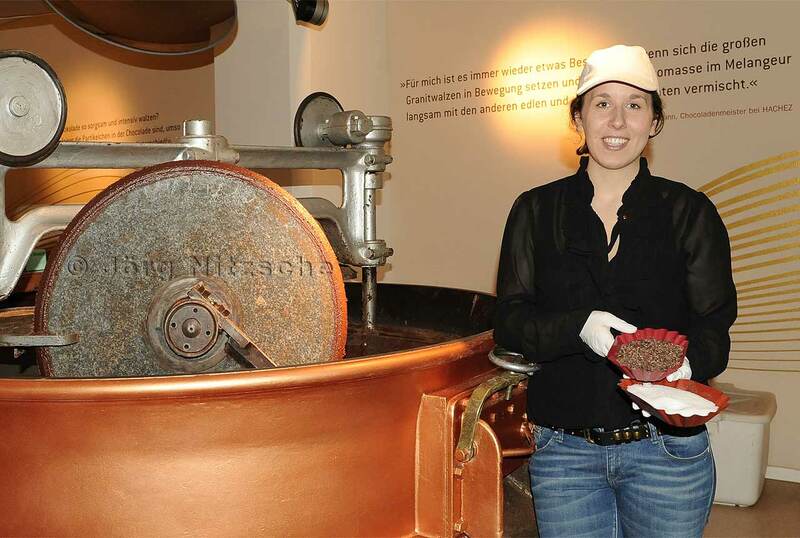 Hachez Chocoversum in Hamburg - adventure world chocolate - from the cocoa bean to the chocolates ! Hachez Chocoversum Hamburg - View into the granite grinder. Hachez Chocoversum Hamburg - Experts take you on a pleasure trip of a special kind. They try around the equator and get exciting background knowledge about the cultivation and processing of cocoa. Hachez Chocoversum Hamburg - . Hachez Chocoversum Hamburg. 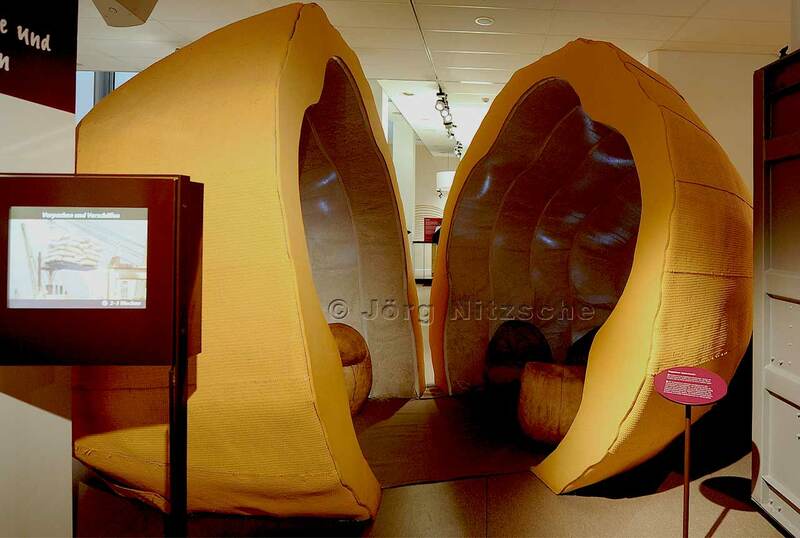 Hachez Chocoversum Hamburg - the walk-in cocoa pod. Chocolate is no longer just a cheap calorie bomb, but has now rather the reputation of a fine gourmet product with health-promoting content. And also in the shops, this trend to the noble chocolate can be observed. There are more and more expensive chocolates sold with cocoa content of up to 80 percent. Some are finely seasoned with chilli, others special mixes to boost the flavor. With over 300 different, valuable ingredients in the cocoa pod, such as Anandamides (mood enhancer), also vitamin B2, calcium, potassium, magnesium and iron, dopamine (neurotransmitters), epicatechins (antioxidants), histamine, serotonin (anti-stress neurotransmitters), Tryptophan (Anti-Depression Amino Acid), Phenylethylamine (PEA), Polyphenols (Antioxidants), Tyramine and Salsolinol, it is not only mind-brightening but also promotes good health. And how does a cocoa bean really taste? The cocoa bean (Theobroma cacao) is the fruit of the cacao tree, which belongs to the mallow family. Cocoa is an evergreen tree that grows in the undergrowth of rainforests, and can grow up to 15 feet tall. The cacao tree owes its botanical name to the Swedish naturalist Carl von Linnaeus, who gave it the name Theobroma cacao = food of the gods (Greek theos = "god" and broma = "food"). The cocoa pod is native to South America, probably from the equatorial slopes of the Andes. The Spaniards brought the cocoa to Europe, where it first triumphant as drinking chocolate, later in the form of chocolates, praline, etc. Today, the cocoa pod is grown mainly in Central and South America, the Antilles and in Africa. The main producer is the Ivory Coast in West Africa. The cocoa pod is largely unknown to us. Nevertheless, one should once discover the enjoyment of the "real" chocolate for themselves. Their shell can be yellow, brown, red or orange, it becomes ever stronger with increasing maturity and always shriveled. It can grow up to 30 cm long and weigh between 300 and 800 g. The flesh contained in the cacao pod is tender melting to slimy, its exotic-sweet taste can compete with any dream fruit known to us. In it are arranged in five rows 30-60 whitish seeds, which can be described as soft to nutty. These seeds are made into cocoa beans by fermentation, the basis of our famous chocolate, which we know in many variations. That you can eat the cocoa beans but also raw, which is largely unknown to us, their taste is actually very much reminiscent of chocolate. Cocoa beans are probably associated with coffee beans, and we do not eat them - at least not usually. With good luck you can get a cocoa pod over the Großmarkt Hamburg. Such a pod is about twice as big as a coconut and you definitely do not get it at the discount price. Once you have a cocoa pod in your hands, open it, eat the pulp and the cocoa beans, the enjoyment of the experience is worthwhile in any case. Because you get a sense of the historical story about the cocoa, which we do not suspect alone with the finished chocolate. Großmarkt Hamburg Experience the enjoyment of the senses at the "Food Market Hamburg", which always takes place in September. 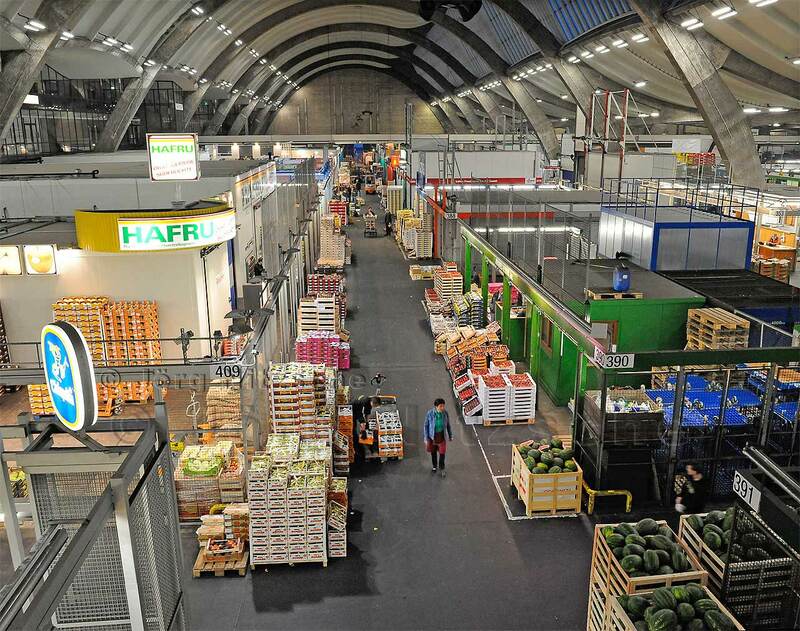 Ever wanted to know what's going on in the Hamburg hypermarket halls? Then you can go live with a competent guide on a major exploration tour, just click the link below. Under "Verbaucher" you will find the dates and all relevant registration formalities. Großmarkt Hamburg - One thing counts above all here . . . . . . the fresh! 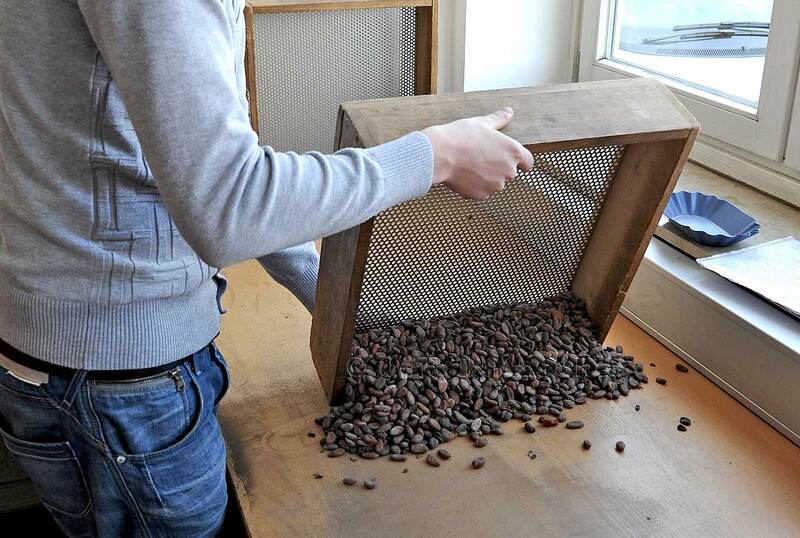 Since in the Chocoversum not the complete production of a bar of chocolate can be illustrated, one limits itself here to the roasting, the Melangieren (mixing), rolling and conching (longitudinal rubbing). In Melangeur the raw products are mixed. 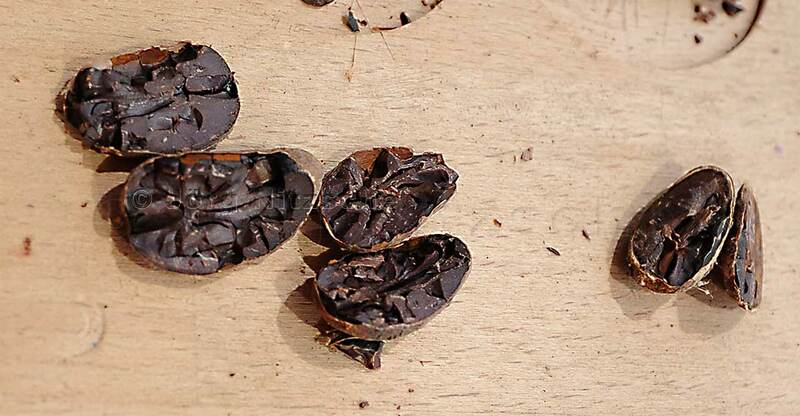 The roasted cocoa bean is already detached from the shell and crumbled into small pieces before it enters the melangeur. The roasted raw cocoa, cocoa butter, sugar, milk powder, lecithin and flavors are added. These ingredients are then mixed by the granite rollers until they have joined into a mass. Mixed with the other ingredients, the bound, partially lumpy mass is then added to the three-roll and rolled until a fine dusty homogeneous powder is formed. Then the conche, the so-called longitudinal grater, is used. 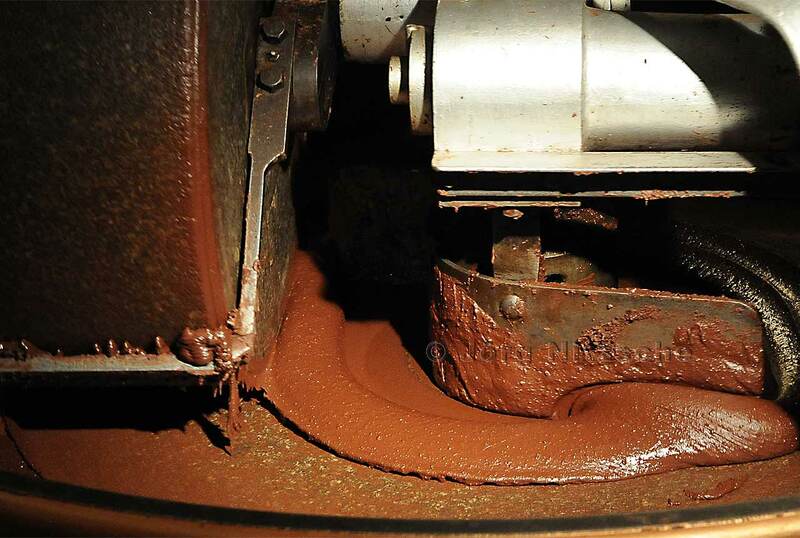 The chocolate mass remains in the conche for up to 72 hours, so that unwanted flavors can volatilize through stirring, turning, turning and venting and desired flavors can develop.